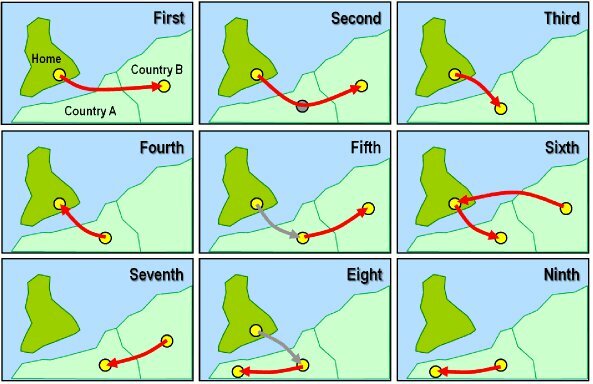 PROBABLY THE MOST IMPORTANT, COMPETITIVE AND DENSE INTERNATIONAL ROUTE in any form of transportation is the North Atlantic. 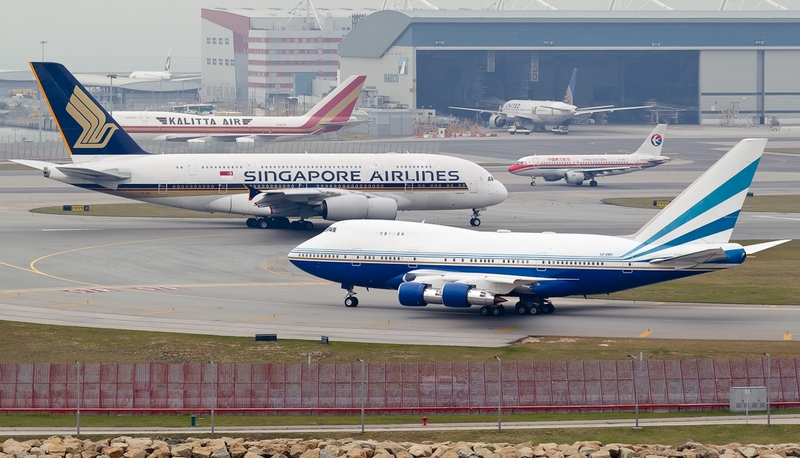 Today, hundreds of flights make the crossing daily between the major cities of the United States and those of Europe. 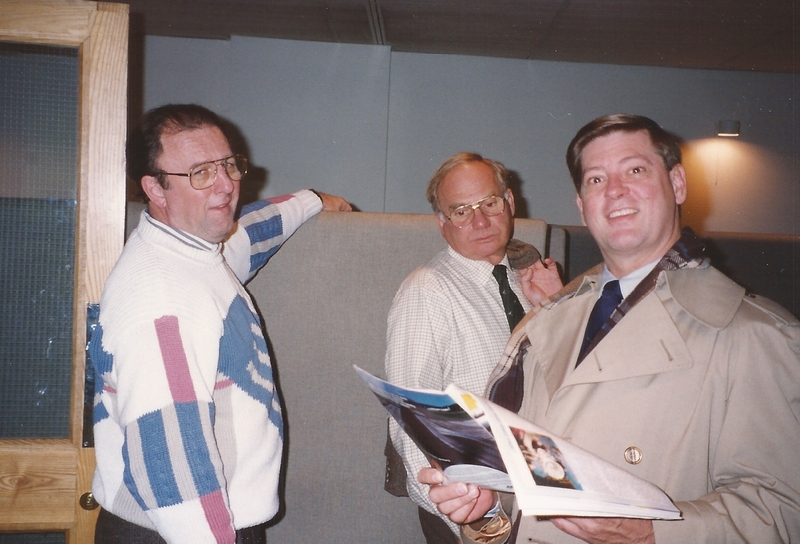 However, it was not always that way. 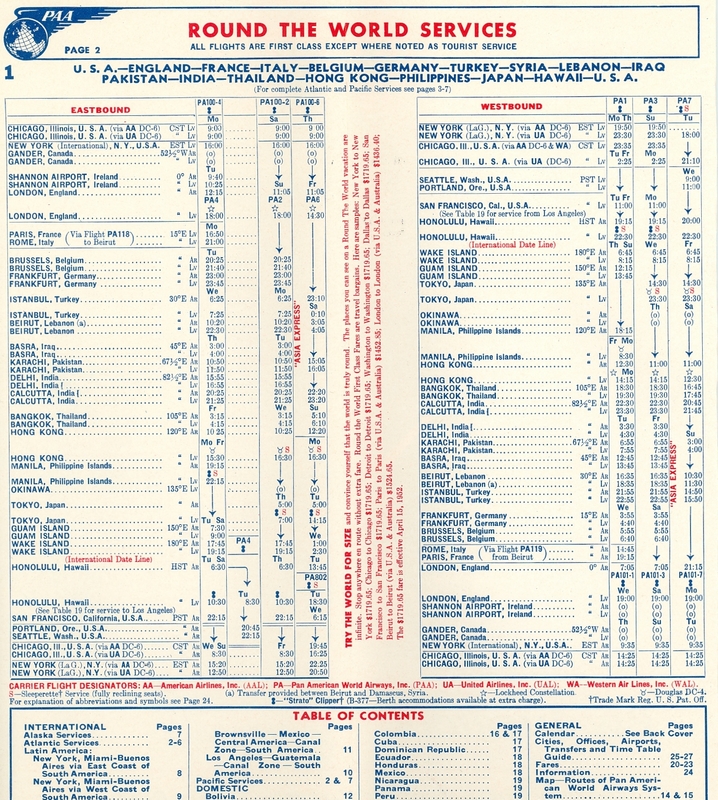 For most of the 19th and 20th centuries, the principal market was between New York and London. 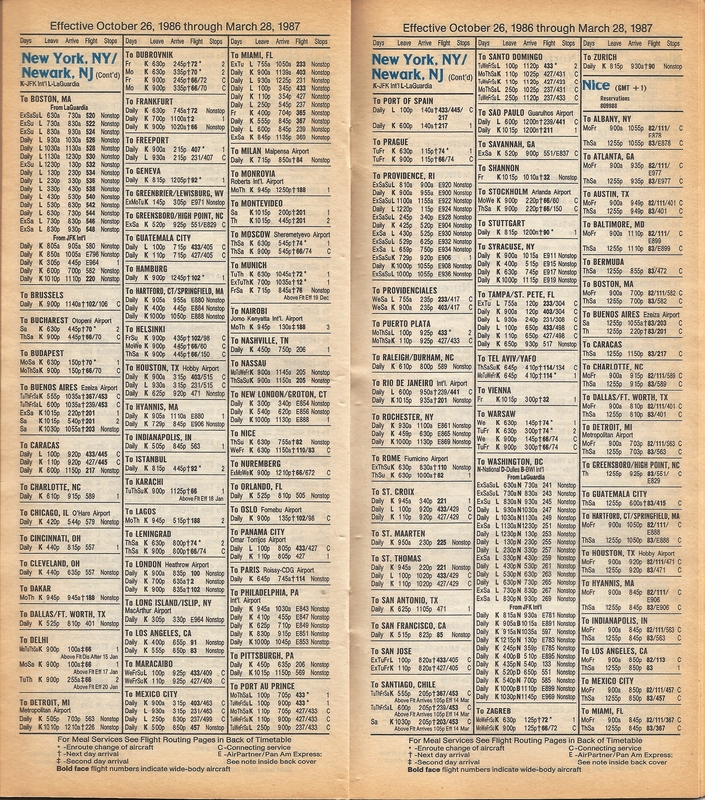 These two cities for all intents and purposes were the main gateways to the United States and Europe respectively, and more passengers and cargo passed through these cities than any others. 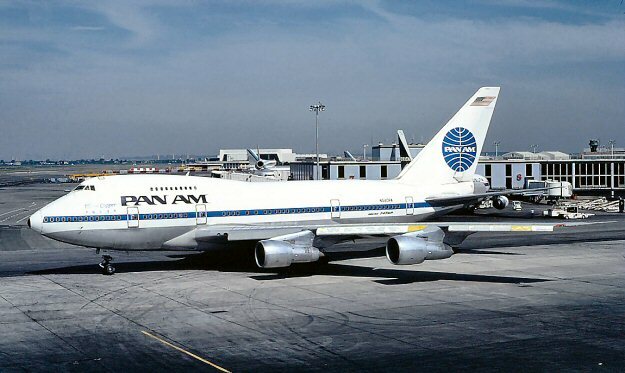 This article will focus on that market and highlight a major player in it, Pan American World Airways and its signature flight, Clipper 100, one of the most prestigious of airline lore. 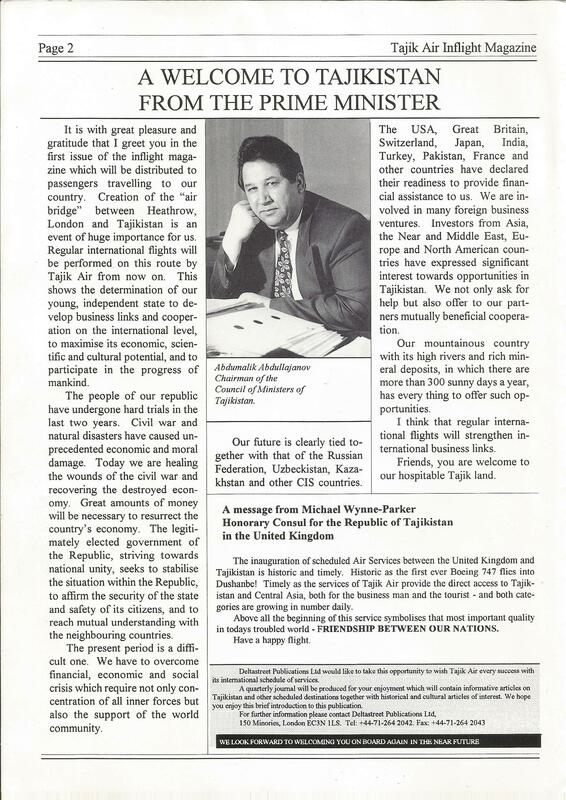 But first, a little history. 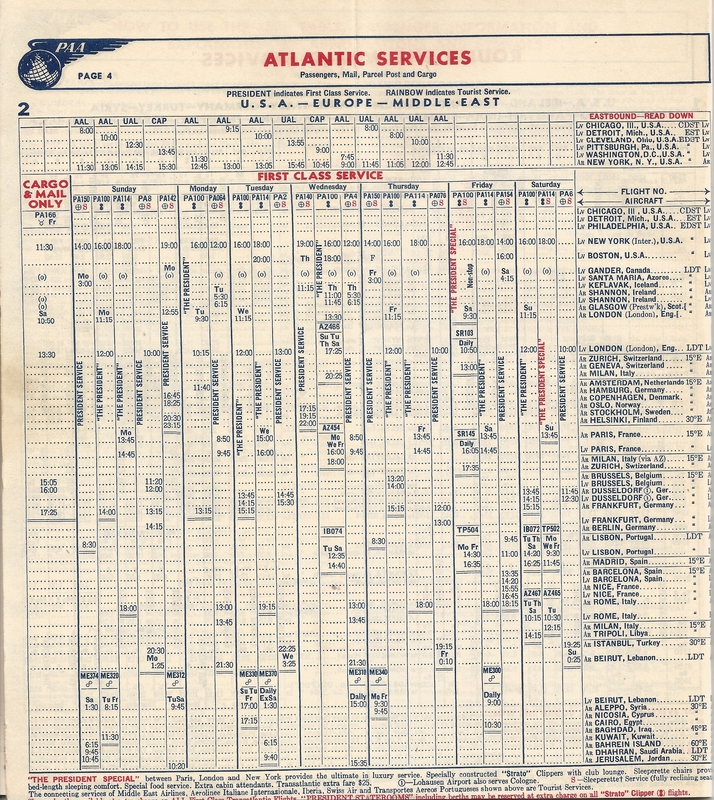 In the 18th and early 19th centuries, crossing the Atlantic was by sail, and the trip was often perilous and time-consuming, often several months. 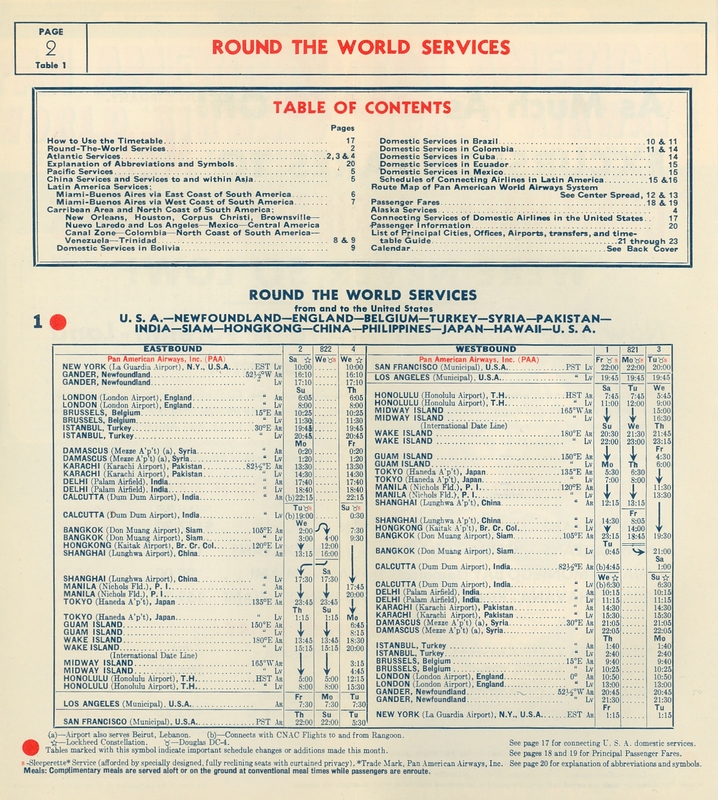 With the advent of the steamship, travel times were greatly reduced and safety and reliability noticeably improved. 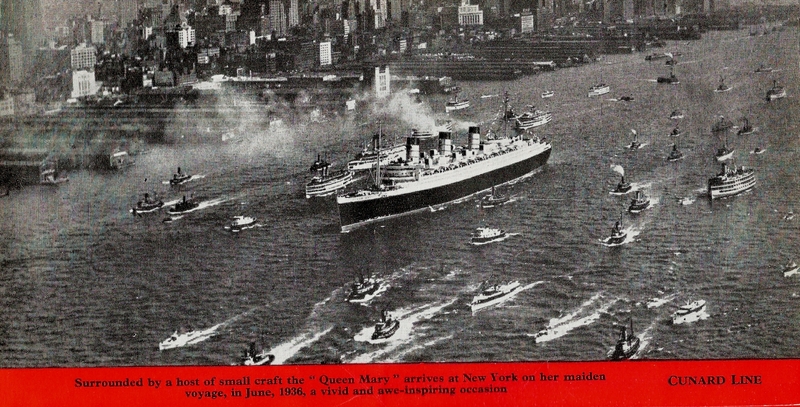 The Cunard and White Star Lines pioneered these routes and developed the great ocean liners that were national and company symbols. 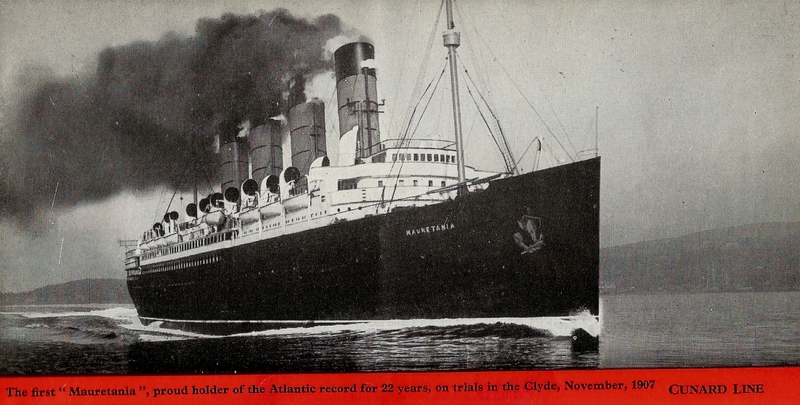 The “grand” ocean liner became a staple in the North Atlantic passenger trade at the beginning of the 20th Century as the technology improved to allow construction of mammoth (at the time) ships with large passenger capacity. 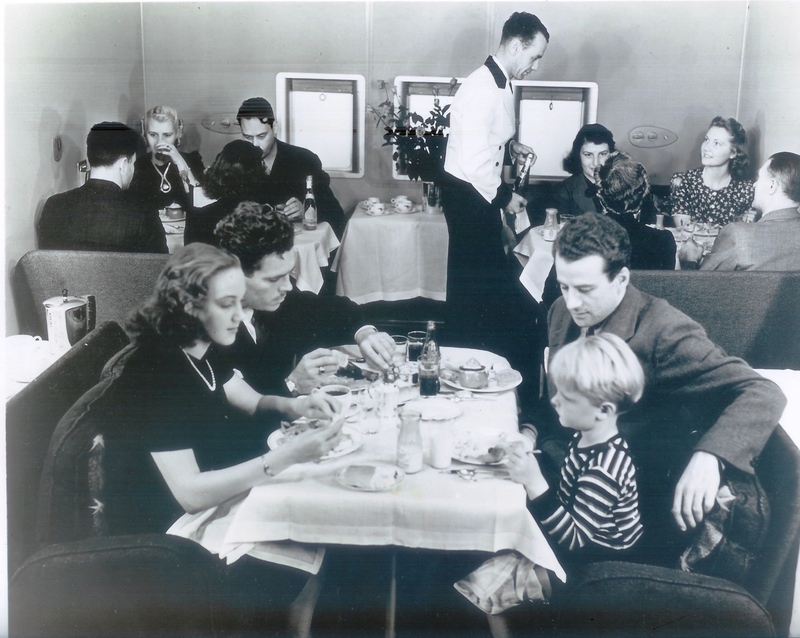 The liners competed in the luxury market offering opulent accommodations designed to please the most discerning of passengers. 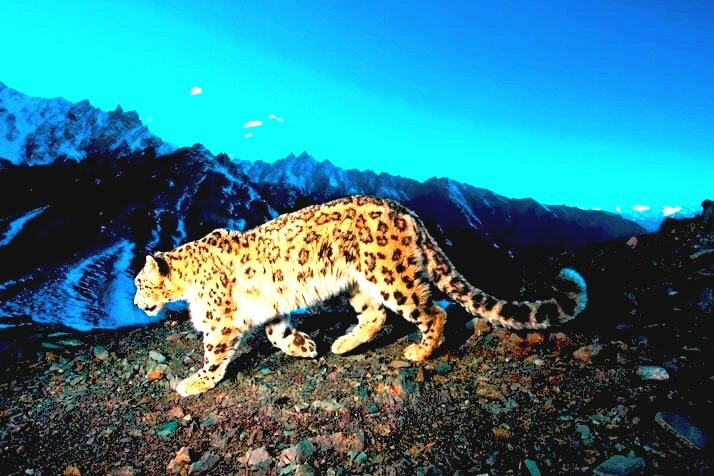 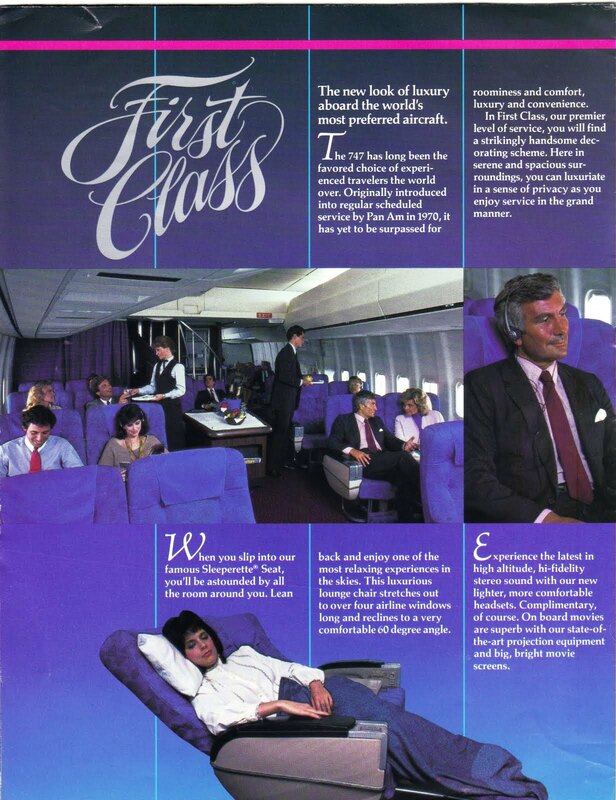 They also competed in speed and comfort. 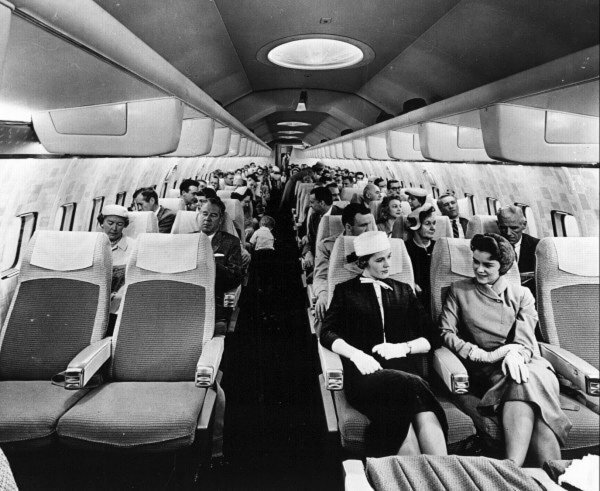 Until the jet age, the liners were the transportation of choice for many a trans-Atlantic passenger. 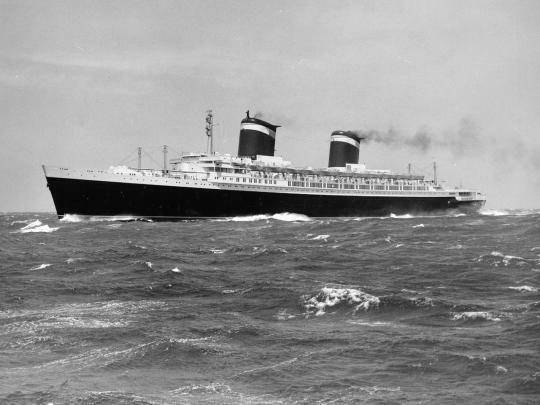 In the US-UK market, the names are legendary: Acquitania, Mauretania, Queen Mary, Queen Elizabeth and United States, to name just a few. 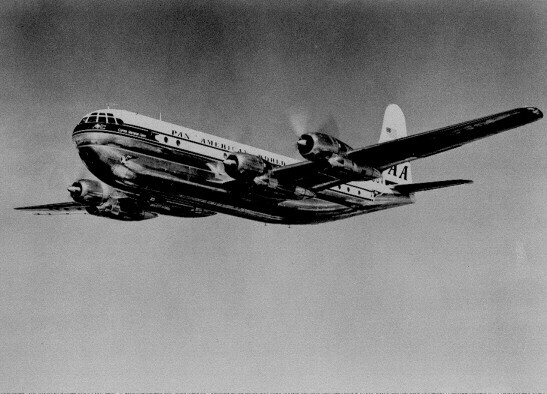 Commercial travel by air in the trans-Atlantic market did not really play a role in transAtlantic commerce until after World War II. 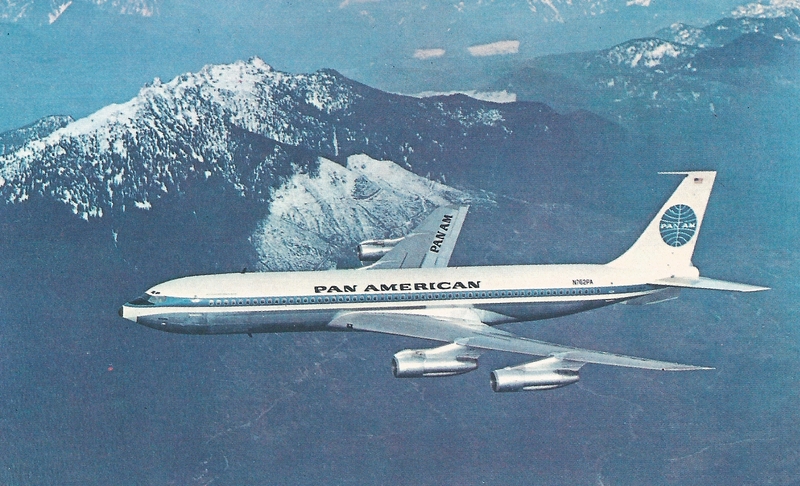 The first commercial flights were pioneered by Pan Am. 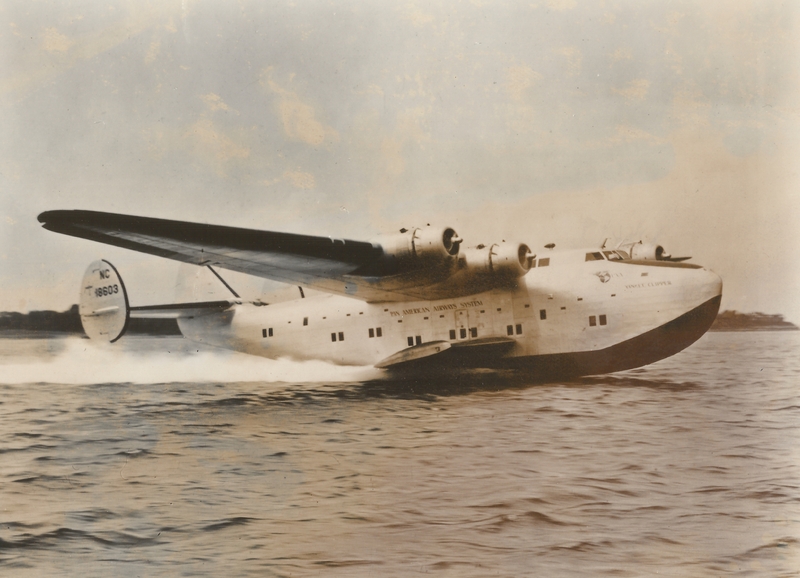 In 20 May 1939 the first transAtlantic mail service was inaugurated when the Yankee Clipper, a Boeing 314 flying boat, flew from New York to Marseilles, France via Horta, Azores and Lisbon, Portugal. 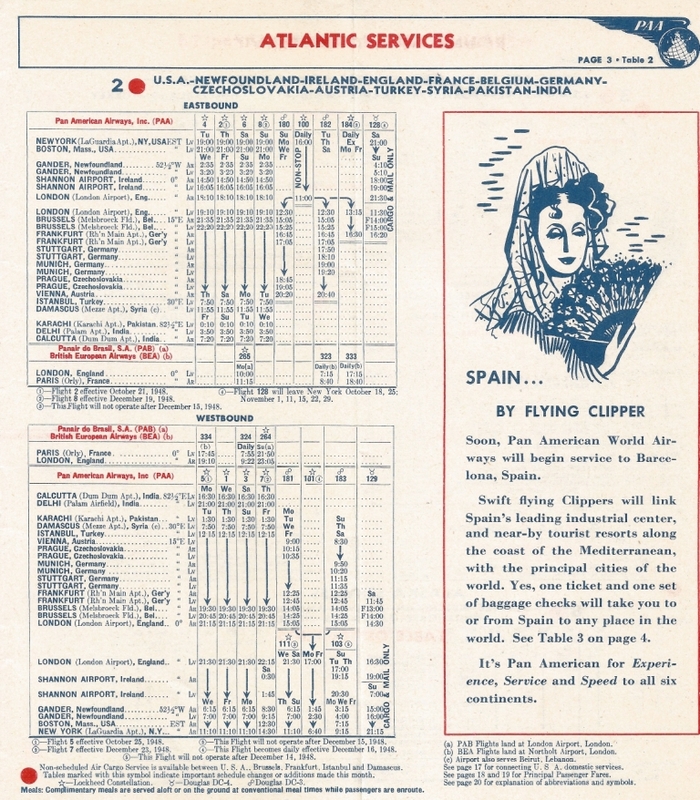 About a month later, on 24 June 1939, the Yankee Clipper established the first airmail service from New York to Southampton, England. 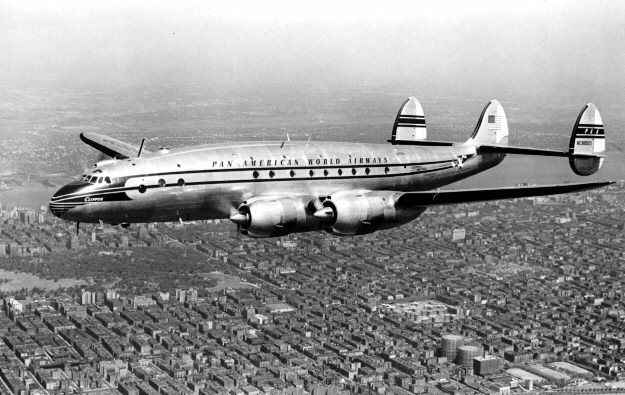 In June 1939, the Dixie Clipper, also a Boeing 314, inaugurated passenger service between New York and Marseilles, and in July, passenger service was inaugurated between New York and Southampton. 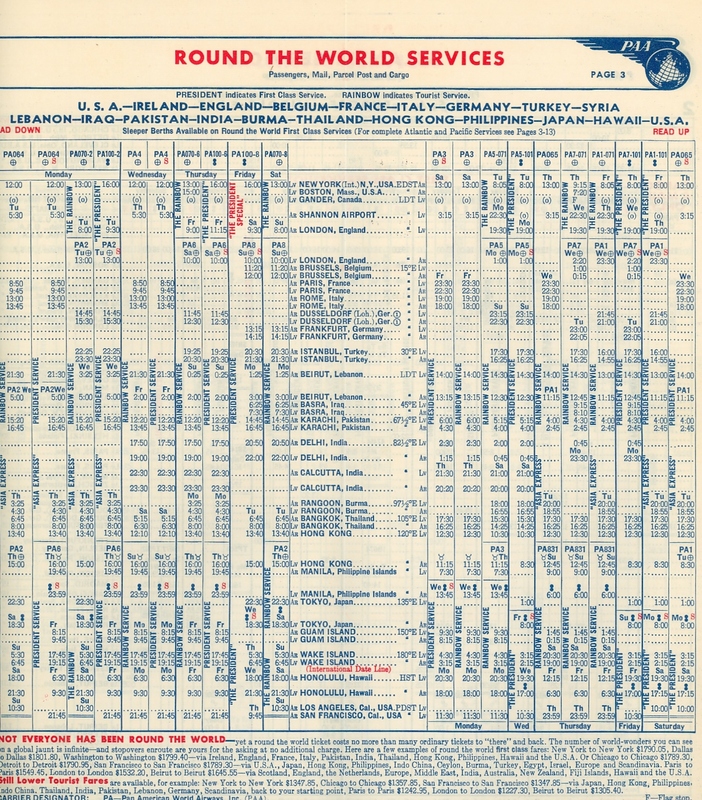 These services were suspended during World War II and it was not until 1945 that passenger service resumed. 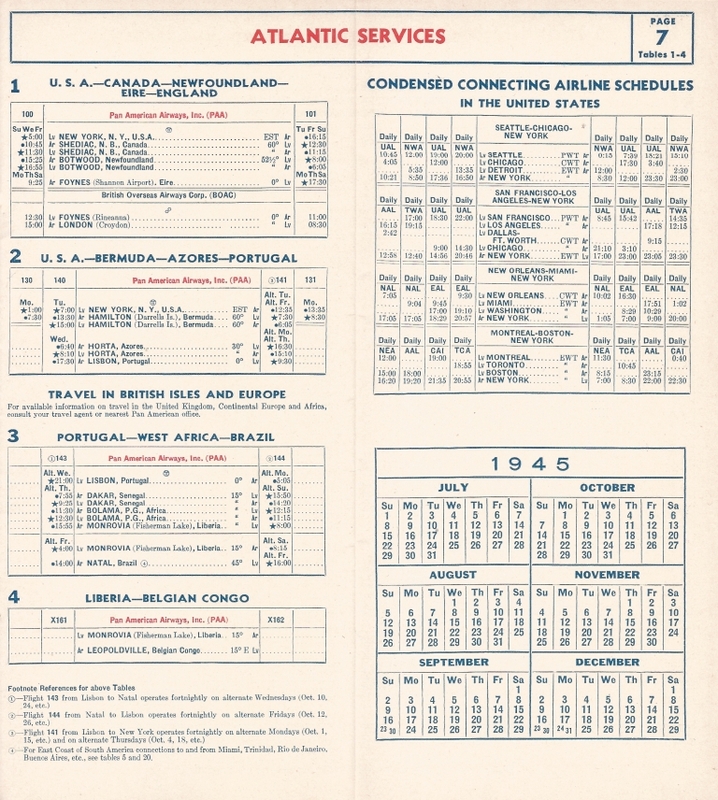 As best can be determined, flights were not numbered in the timetables until the ending of the War. 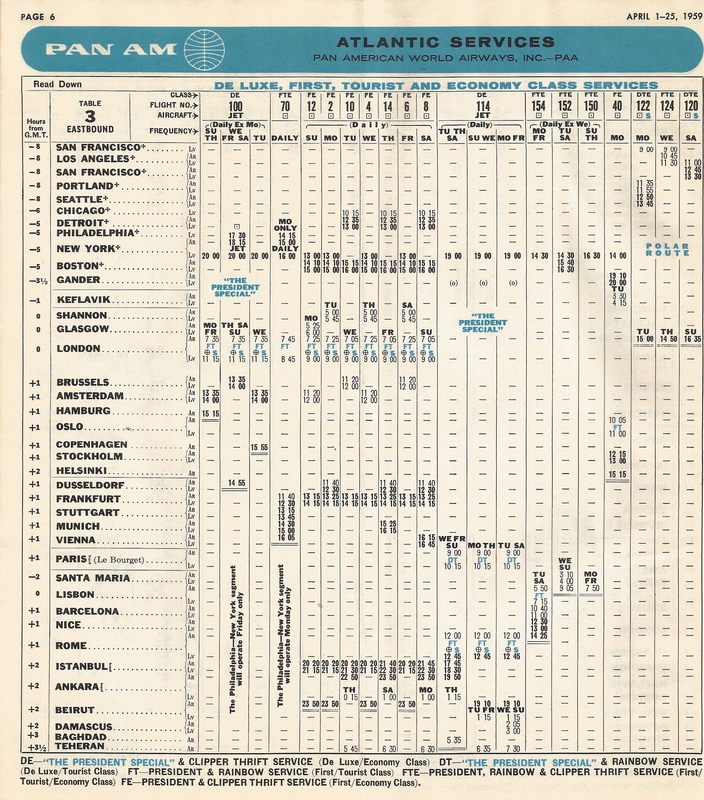 In the October 1945 Pan Am timetable, flights were numbered and the flight between New York and the United Kingdom was identified as “Flight 100”, a Boeing 314. 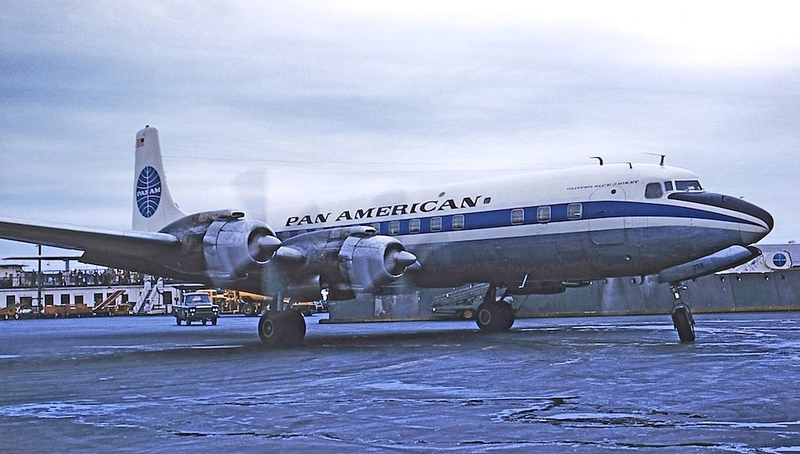 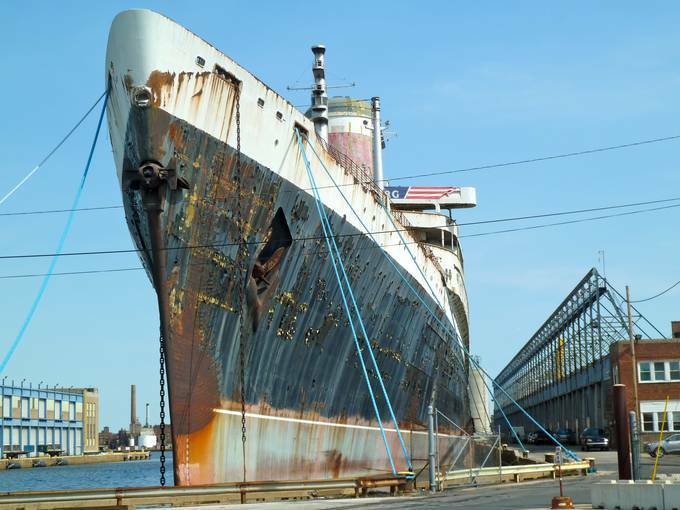 It departed New York’s La Guardia Airport on Sundays, Wednesdays and Fridays at 5 a.m. for Foynes, Ireland with stops in Shediac, Canada and Botwood, Newfoundland. 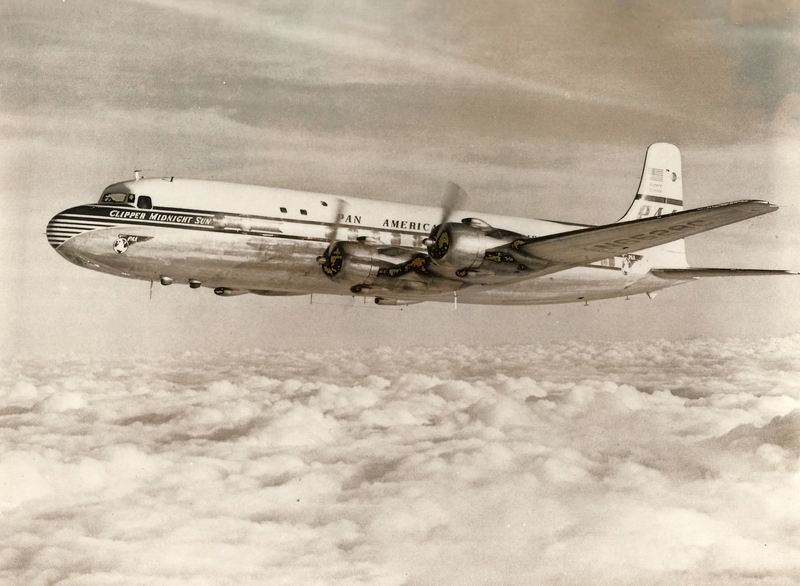 At Foynes, passengers connected with a BOAC DC-3 for London (Croydon), arriving at 3 p.m. the next day. 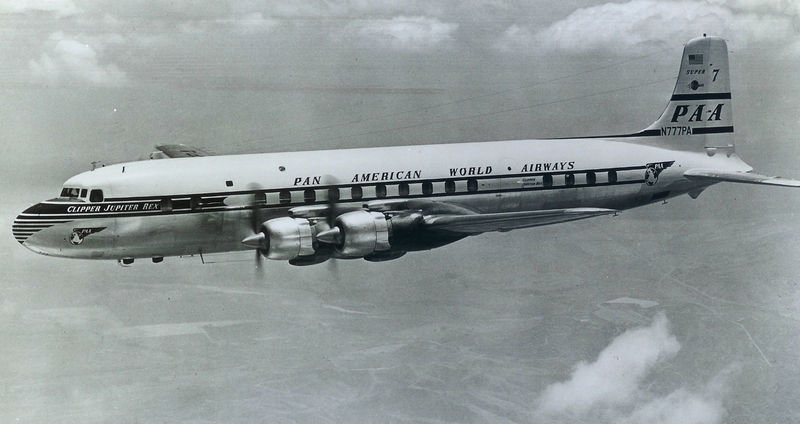 By the October 1948 timetable, the equipment had been changed to a Lockheed Constellation and offered a daily non-stop service departing La Guardia at 4 p.m. and arriving at London Airport at 11 a.m. the next day. 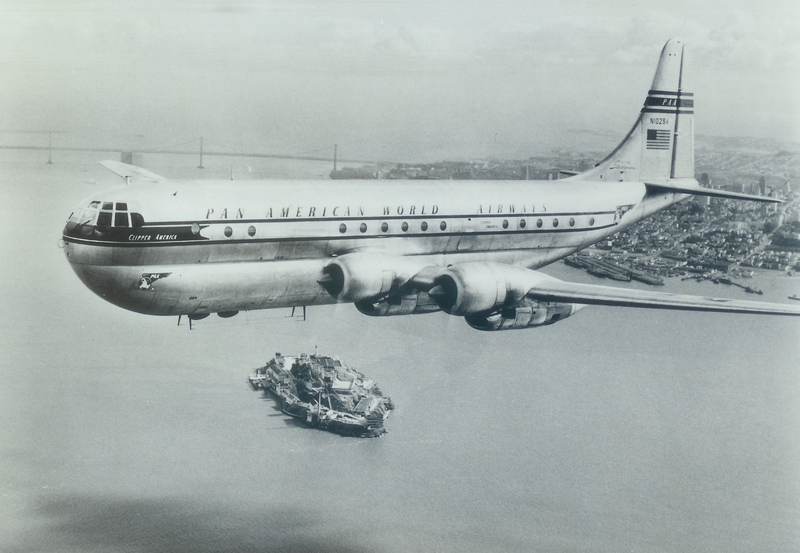 In the 1950’s Flight 100 switched to the Boeing 377. 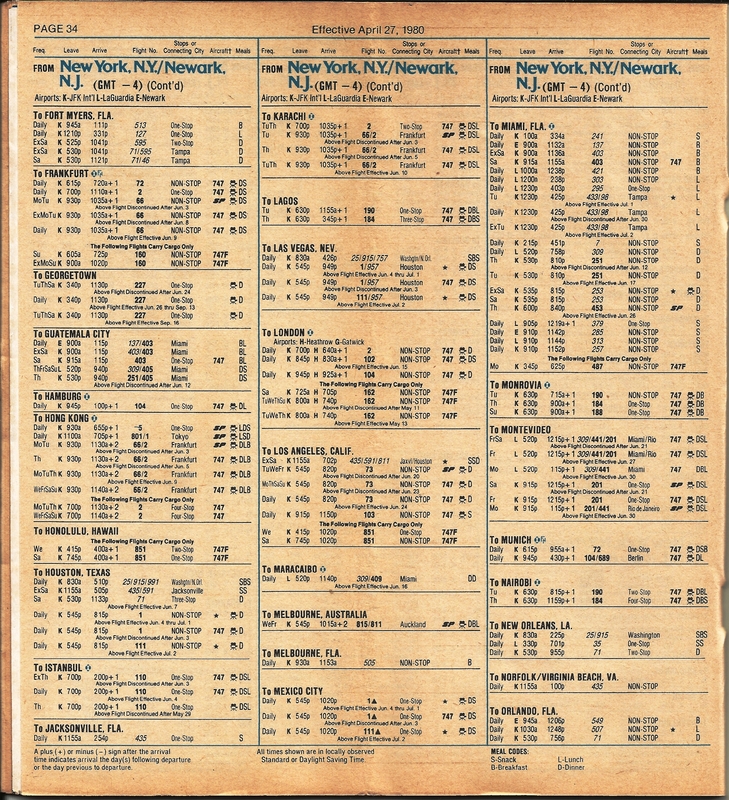 In the June 1954 timetable, the flight departed New York’s Idlewild daily at 4 p.m. arriving London at 9:30 a.m. the next day. 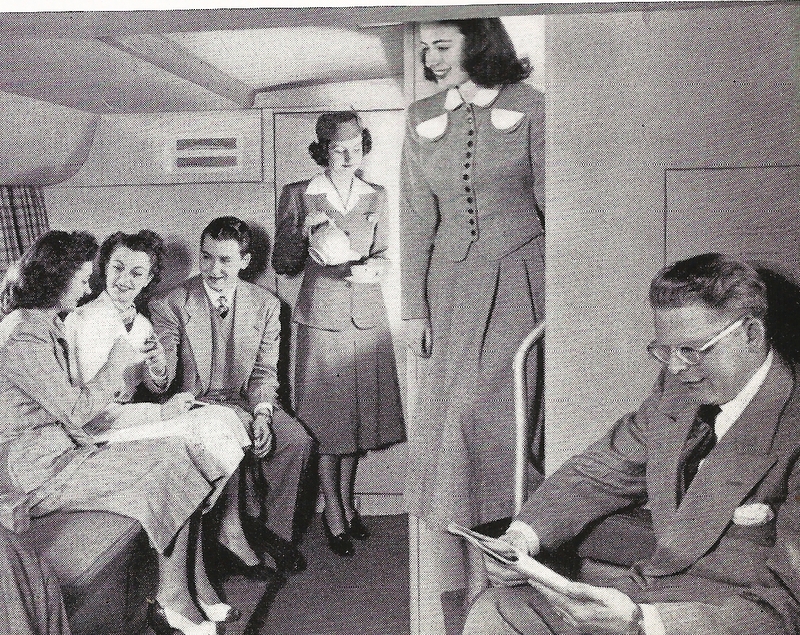 On Fridays “The President Special” service was available, which, according to the timetable, was “the ultimate in luxury service”, featuring “Sleeperette” chairs that provided “bed-length sleeping comfort”. 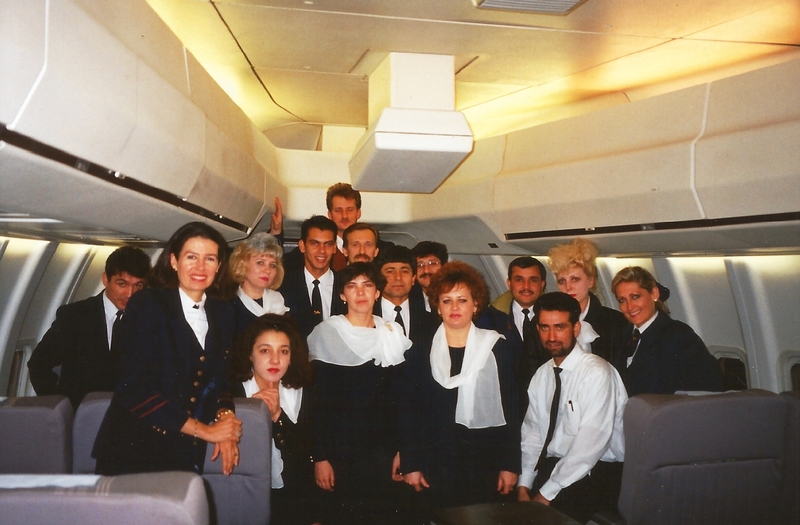 Also included was special food service and extra cabin attendants. 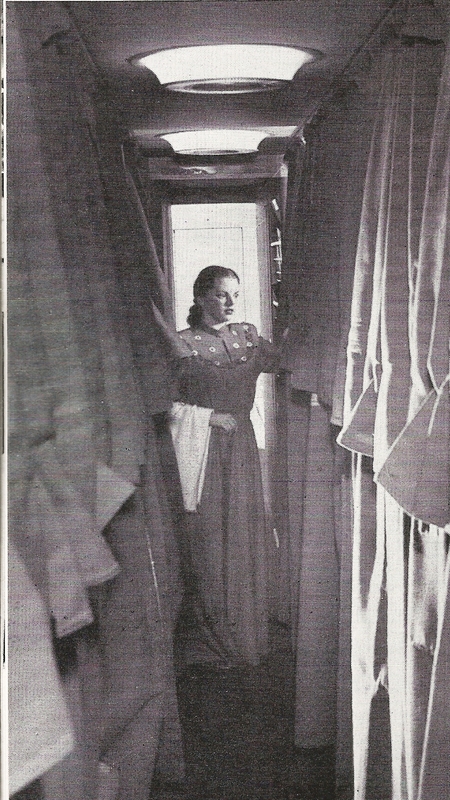 “President Staterooms” with berths were also a feature of the service. 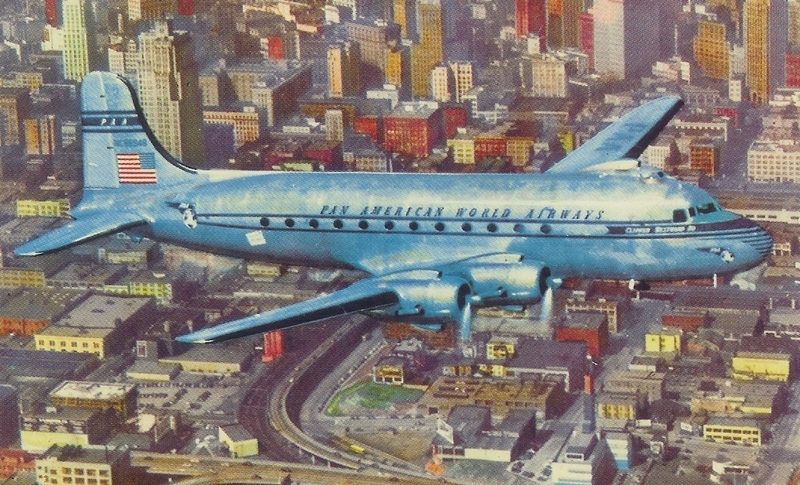 In the October 1957 timetable, the equipment was upgraded to a specially configured Boeing 377 designated a “Super Stratocruiser”. 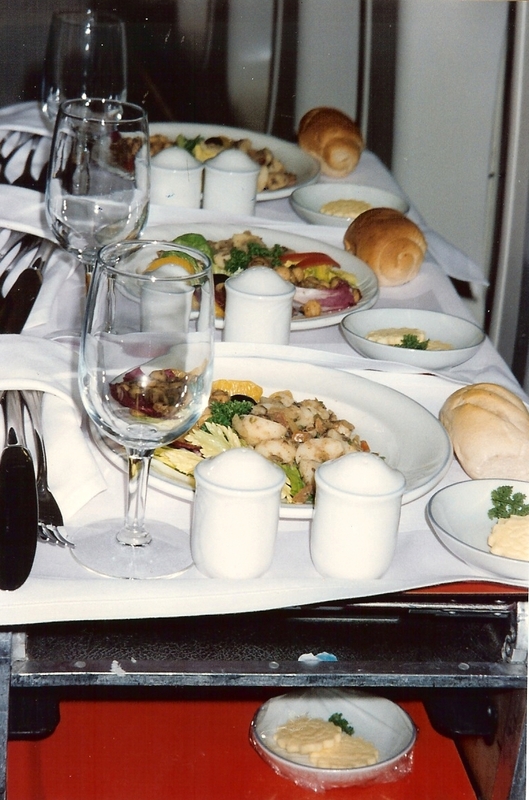 “The President Special” was offered on Fridays. 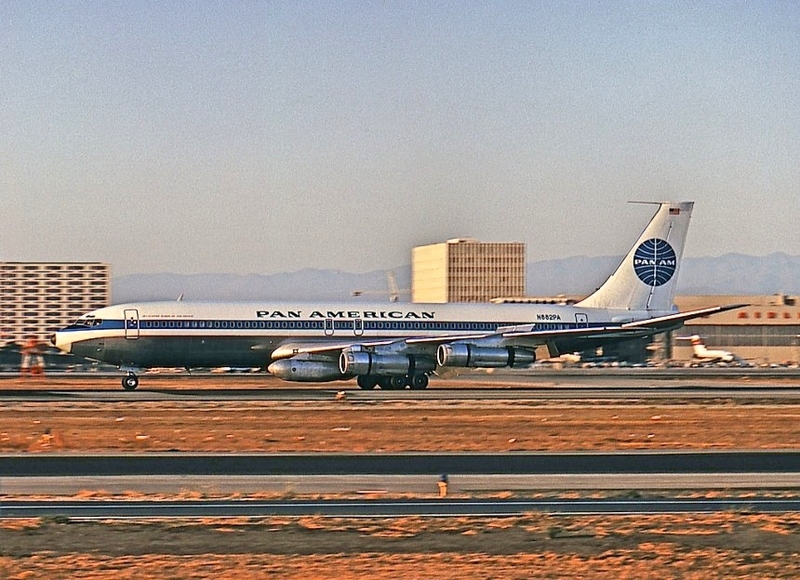 By 1959, a Boeing 707 was operating the service and in the April 1959 timetable, a 707 departed daily at 8 p.m., arriving London at 7:35 a.m. the following day. 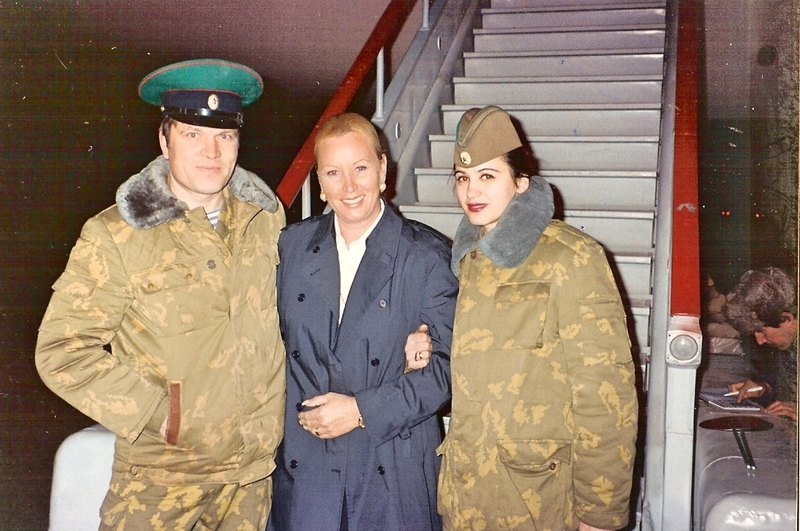 “The President Special” service was offered daily. 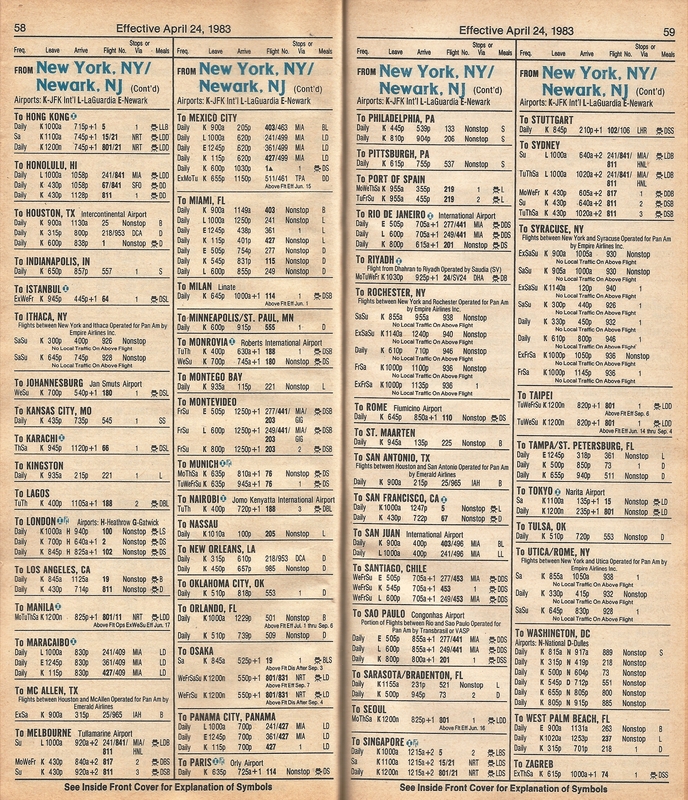 It should be noted that in the timetable effective 26 October 1958, which included the first jet service, Flight 100 had a 10 a.m. departure from New York, arriving in London at 9:35 p.m. 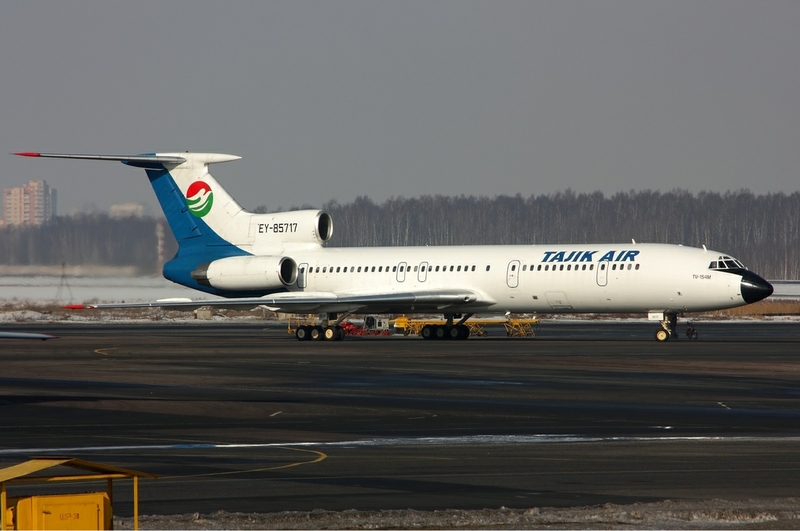 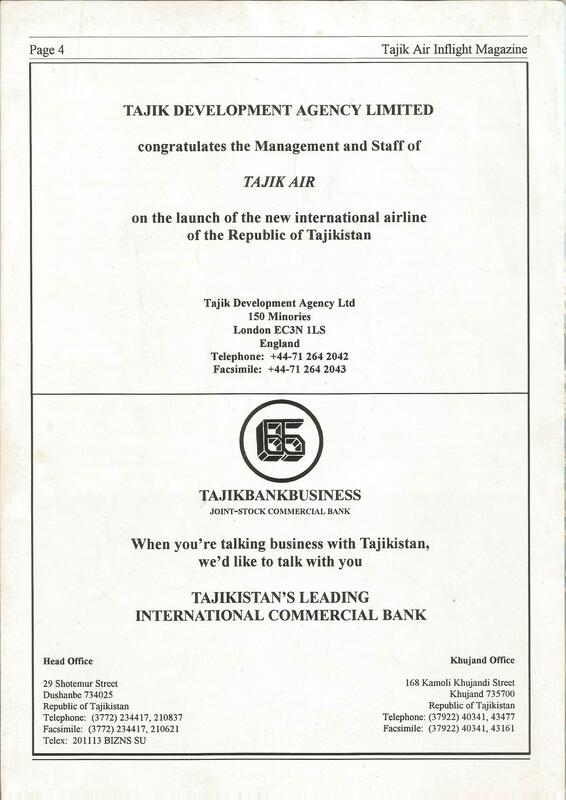 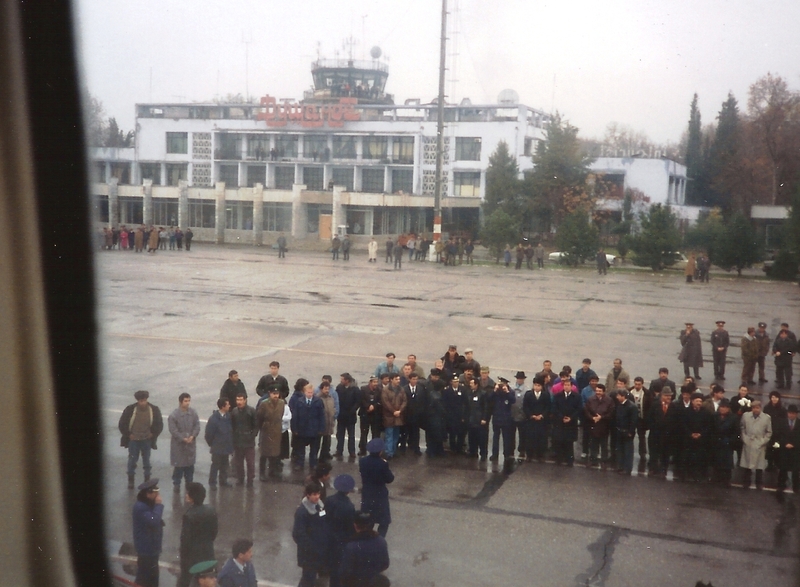 The service was started on 16 November. 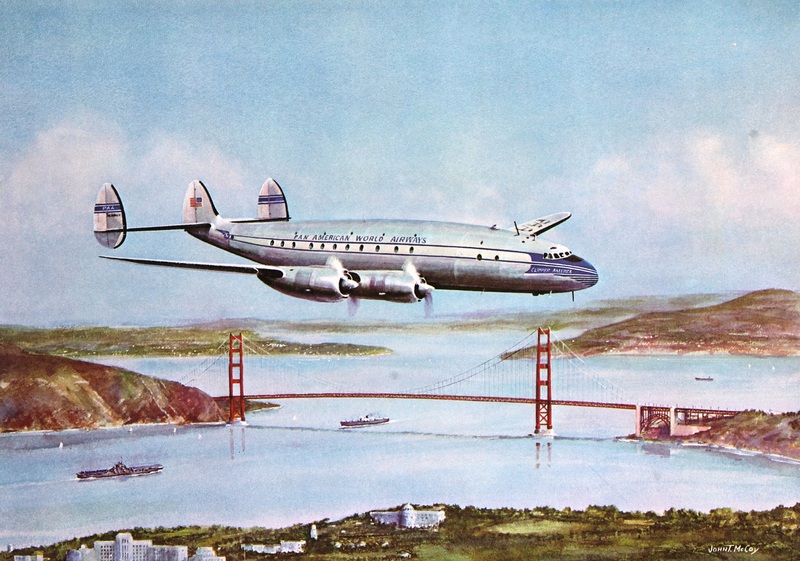 On 15 November, the all-First class Super Stratocruiser service was discontinued. 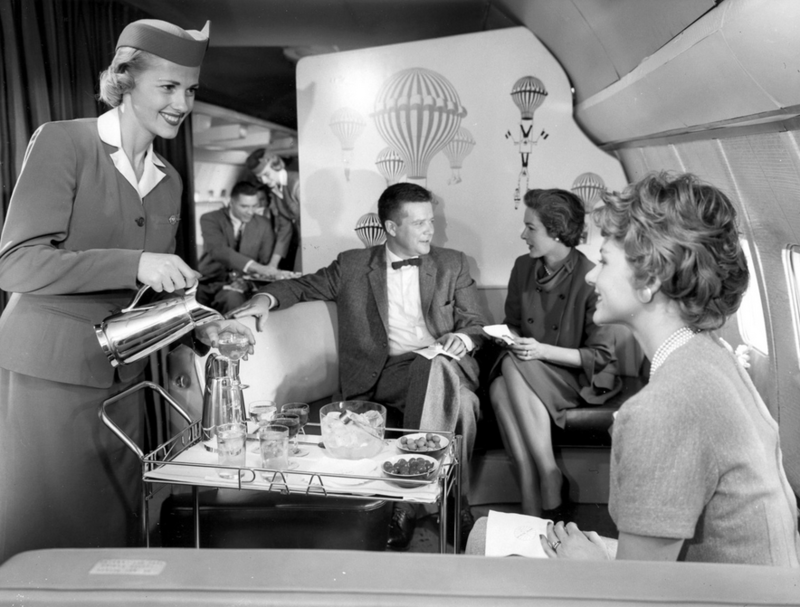 The new jet service was later changed to the evening departure. 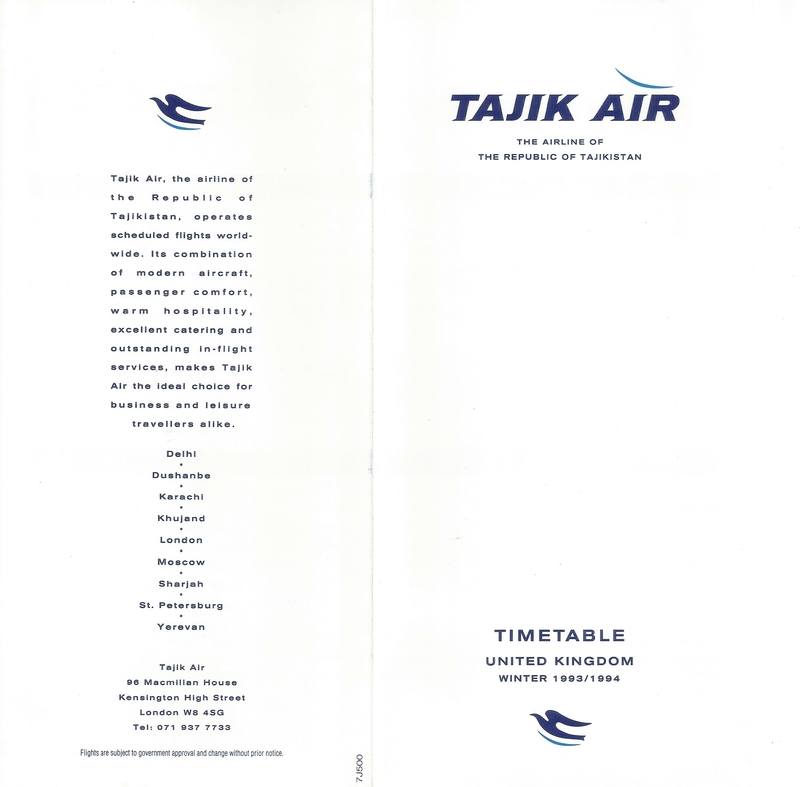 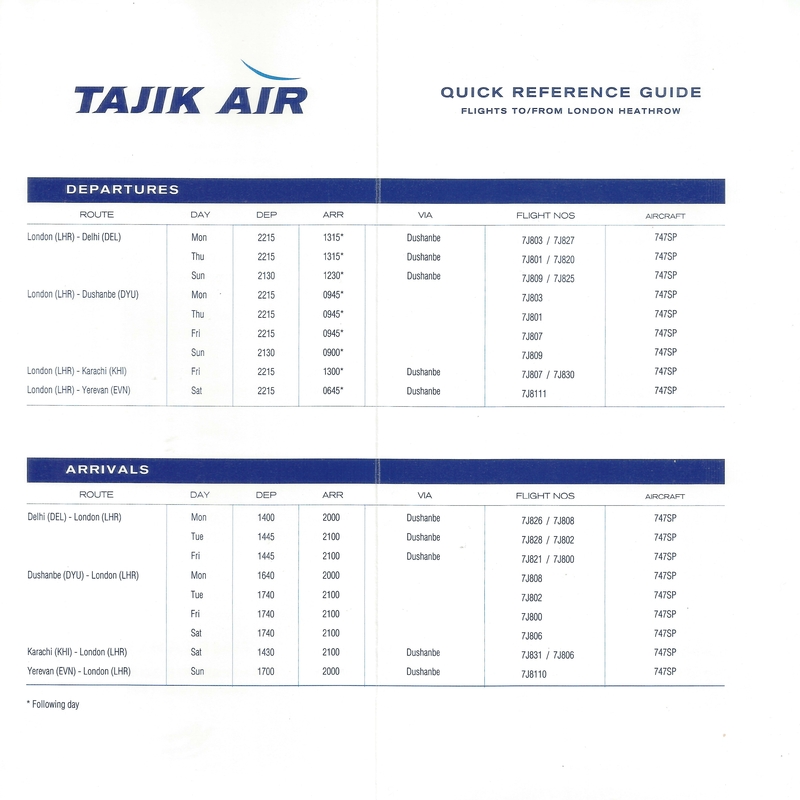 Page from 26 October timetable (above) showing the start of jet service. 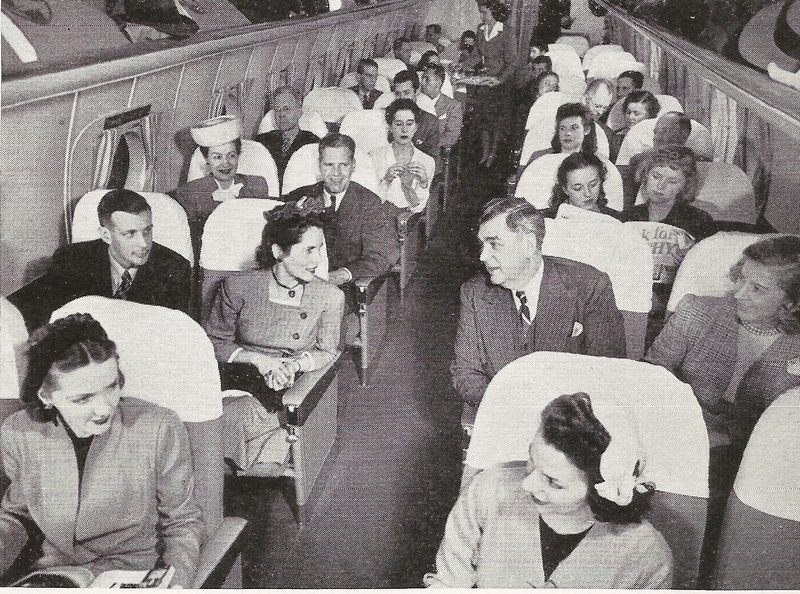 For the first time, flight 100 included two-class service, Deluxe President Special and Economy. 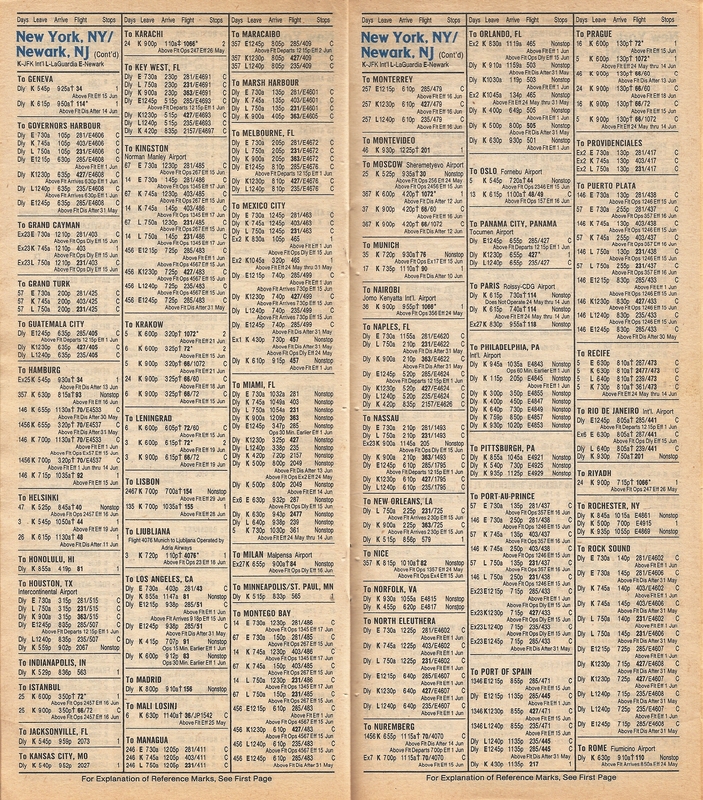 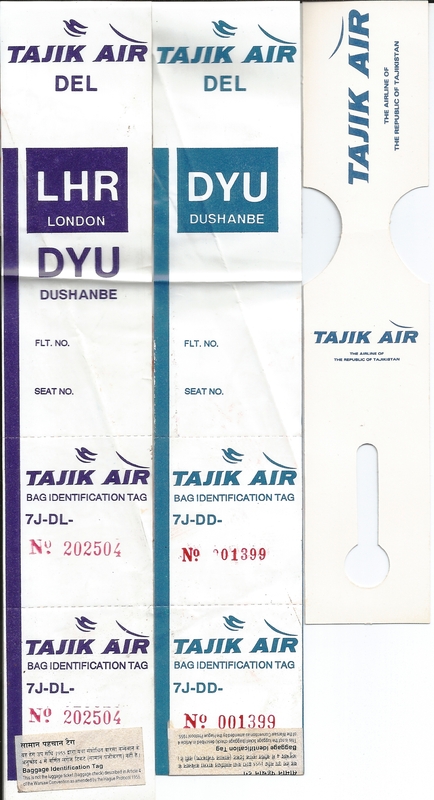 By the 1960’s, Flight 100 was a daylight flight departing New York at 10 a.m. and arriving at London at 9:45 p.m., as shown in the September 1961 timetable. 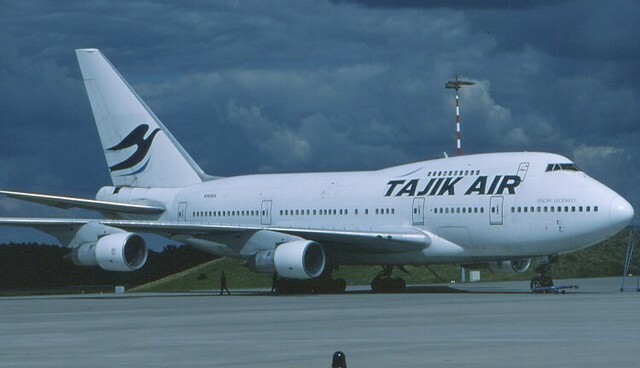 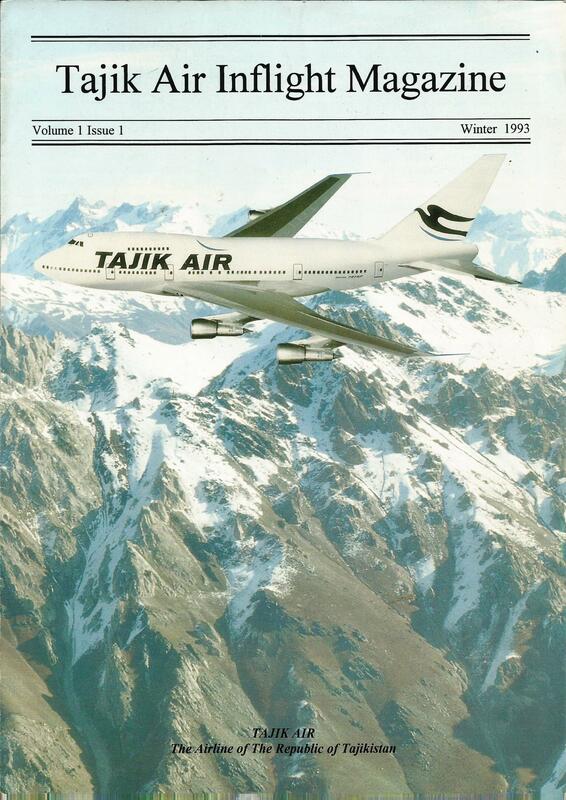 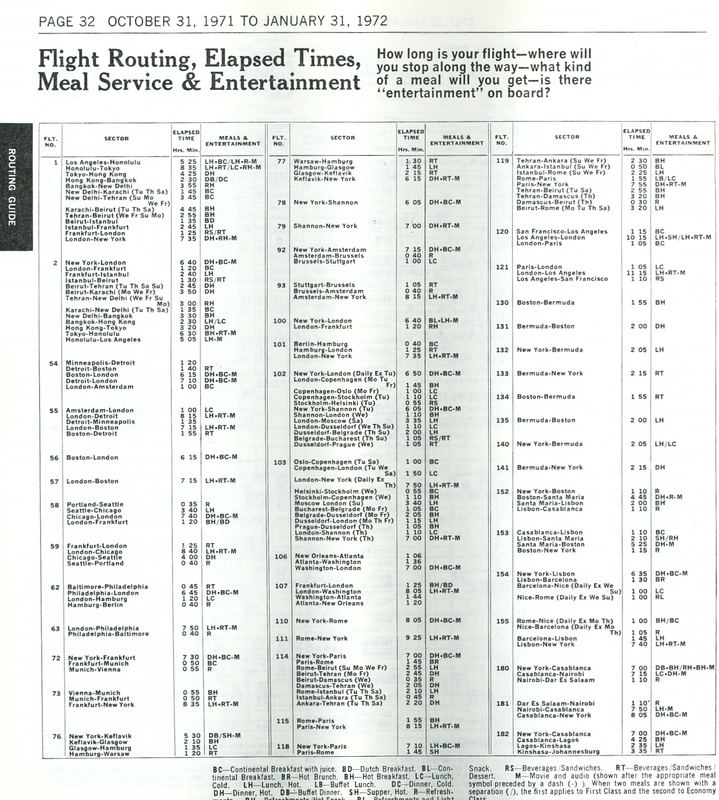 In the 1970’s, the Boeing 747 was introduced to the route, as shown in the January/February 1971 timetable, and continued operating the same daylight flight through the decade as shown in the Summer 1978 timetable. 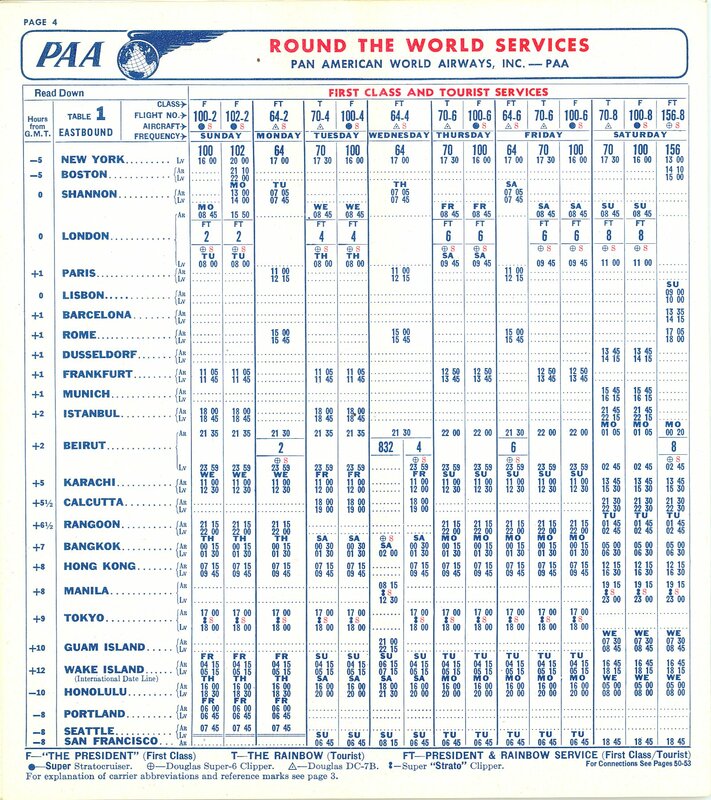 With the merger of Pan Am and National in 1980, Flight 100 was discontinued as shown in the Spring/Summer 1980 timetable. 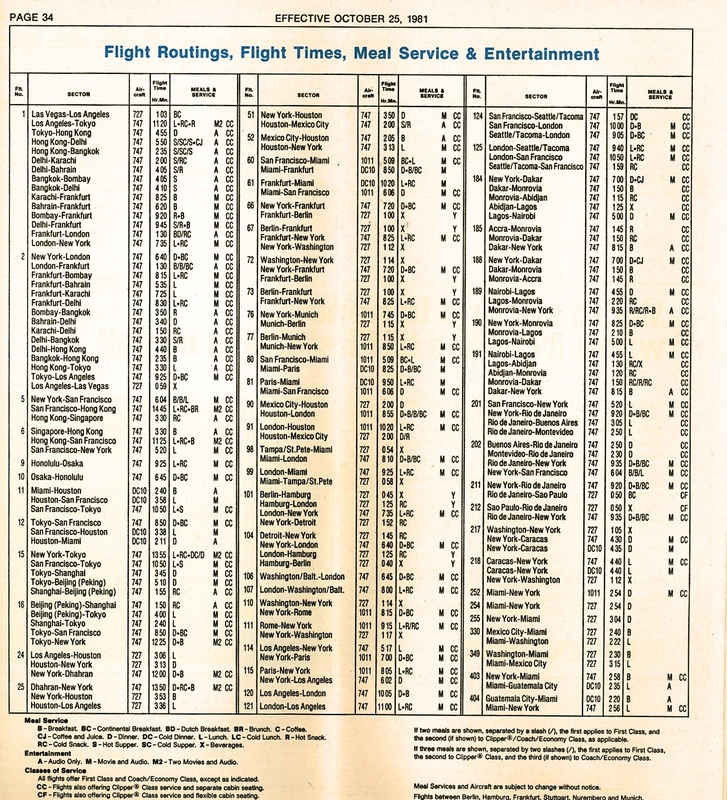 All New York-London services were overnight flights and none were numbered “100”. 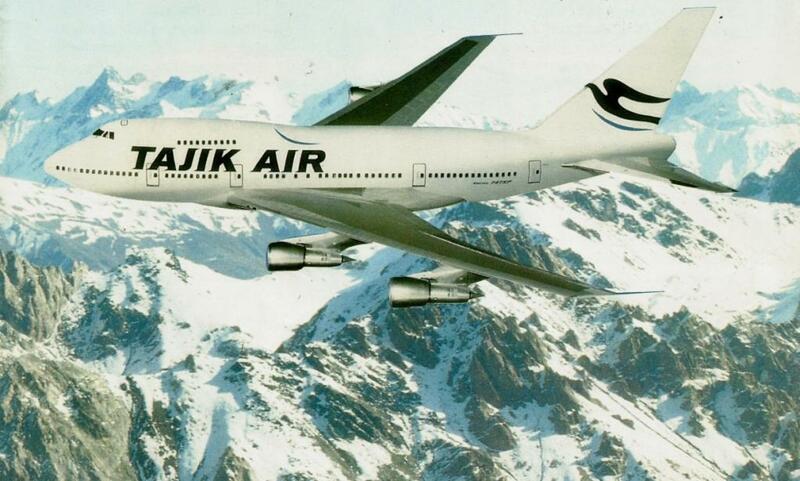 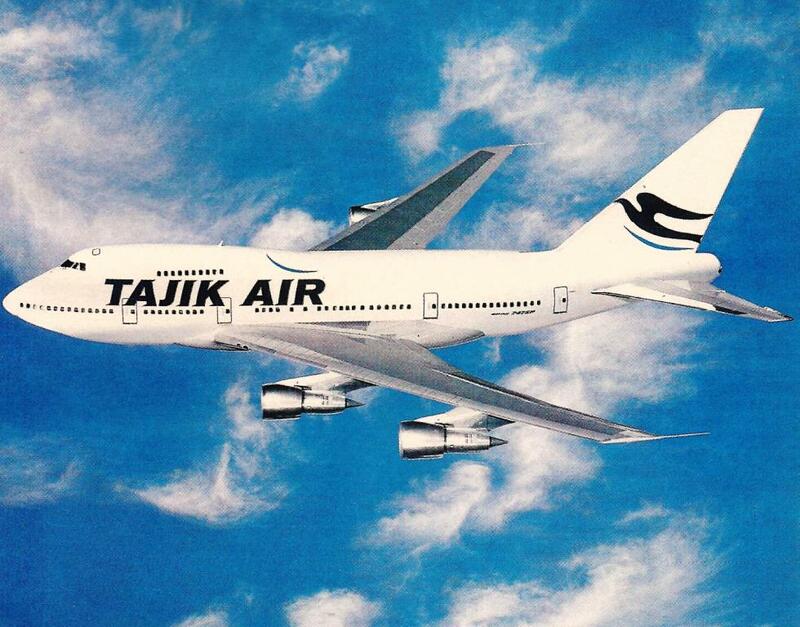 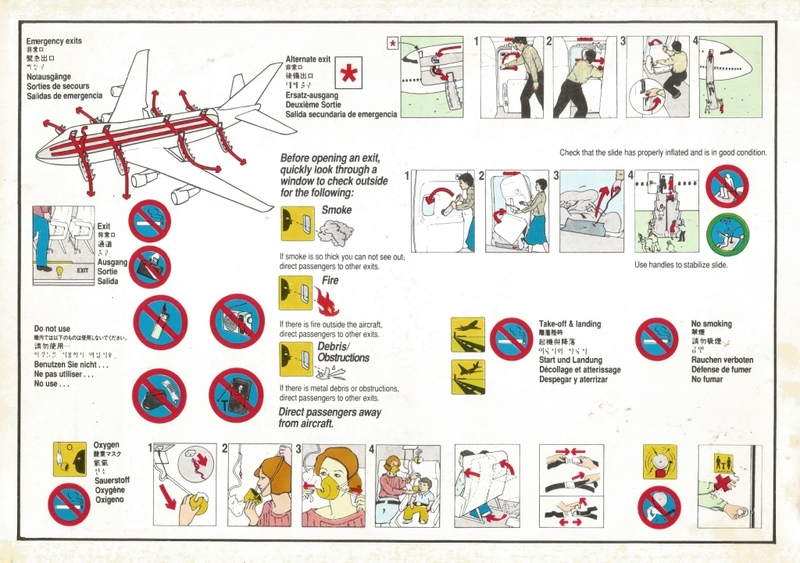 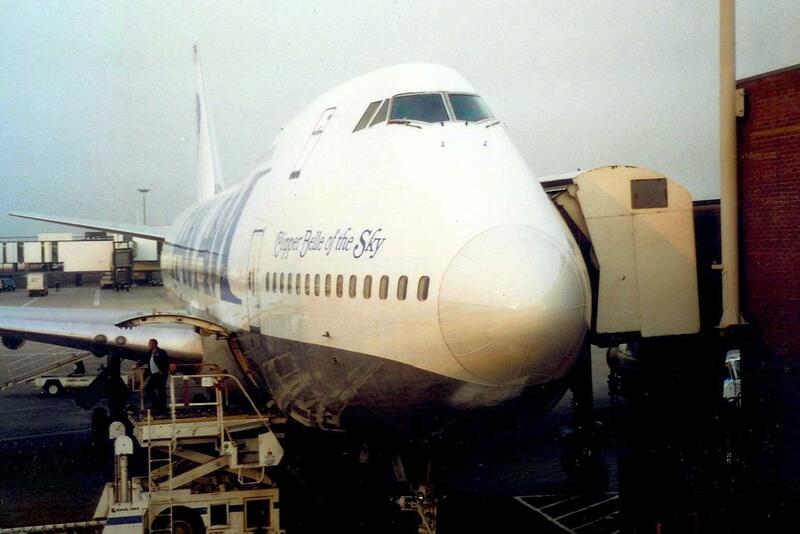 In the timetable that became effective 24 April 1983, Flight 100 returned, operating a daytime flight with a Boeing 747SP. 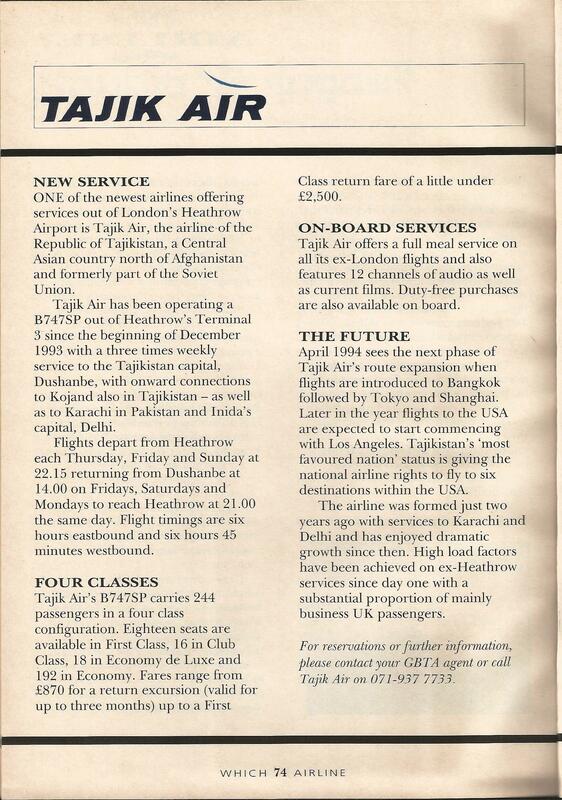 The flight offered 3-class service with “Clipper Class” in a separate cabin, departing at 10 a.m. and arriving in London at 9:40 p.m. Interestingly enough, the timetable announced it as a “New Daily Daylight Service”. 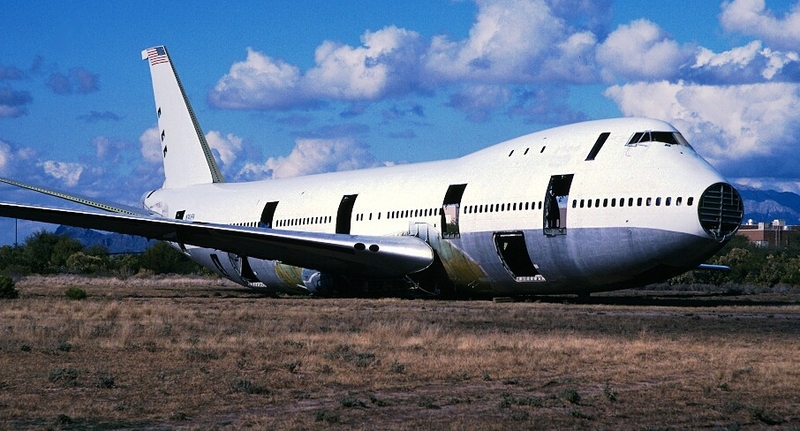 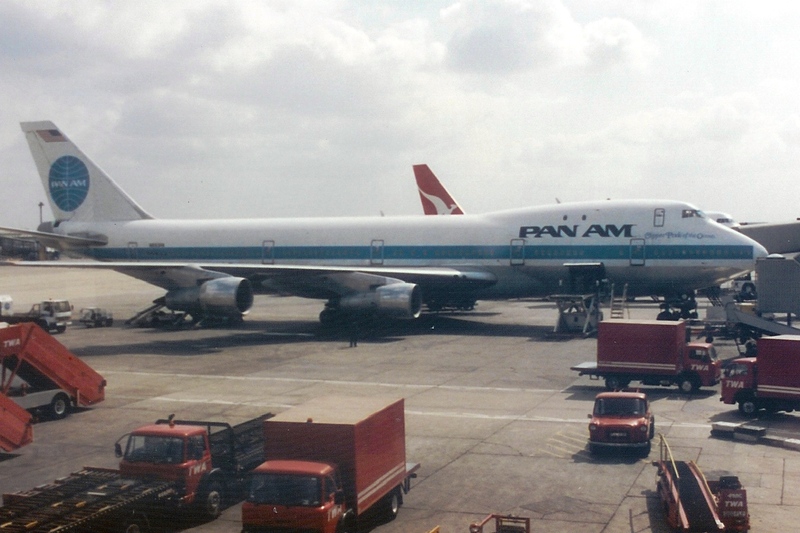 After the sale of Pan Am’s Pacific routes, which included the 747SP fleet, the equipment was changed back to a 747. 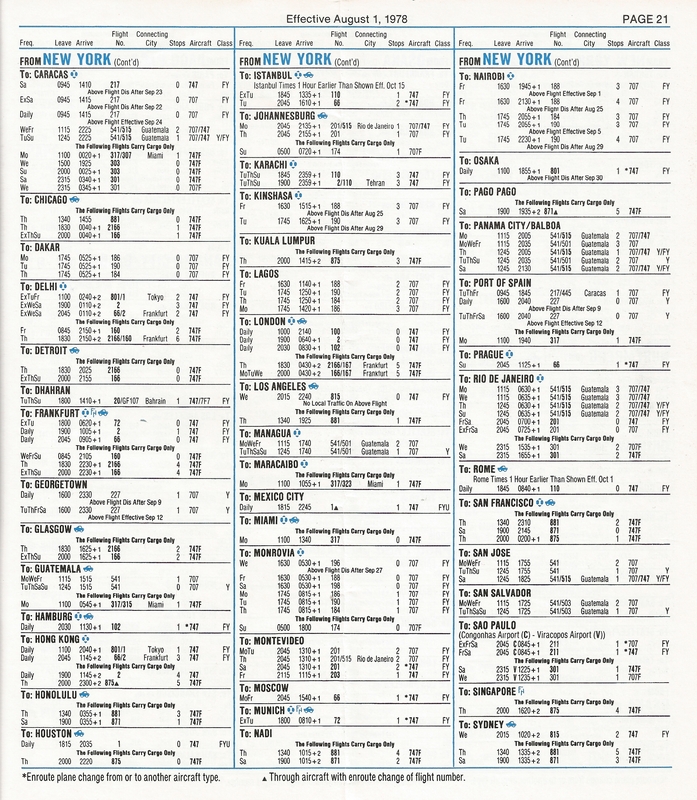 In the timetable effective 26 October 1986 the 10 a.m. departure was changed to 9 a.m., with an 8:40 p.m. arrival. 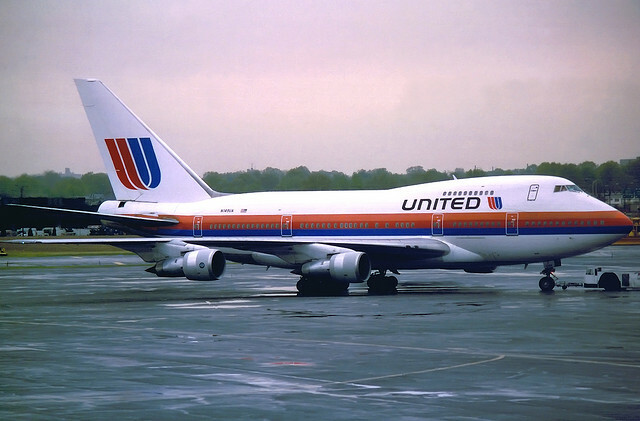 With the sale of the London Heathrow routes to United, Flight 100 came off the timetable. 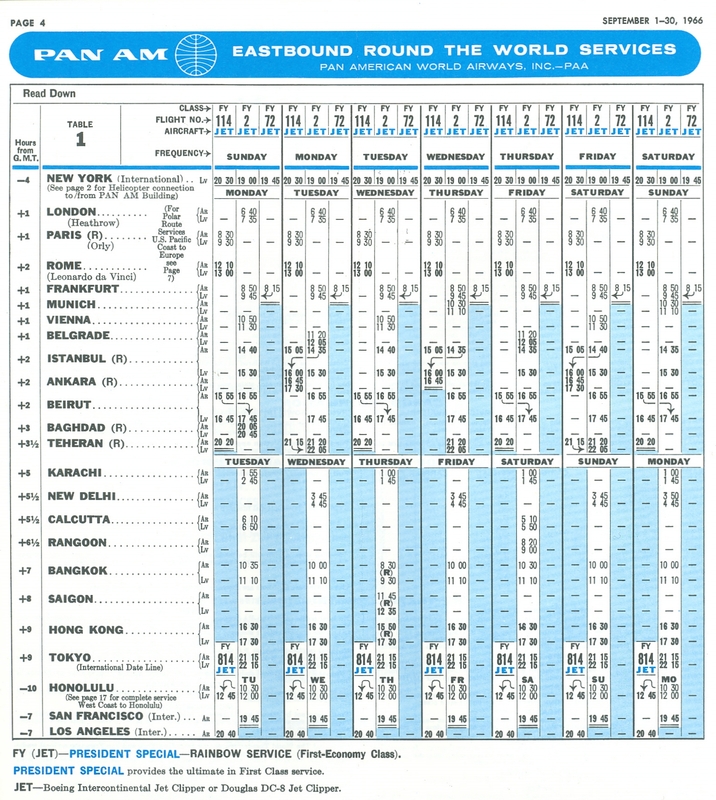 In addition, as shown in the May 1991 timetable, Pan Am no longer operated the New York-London route. 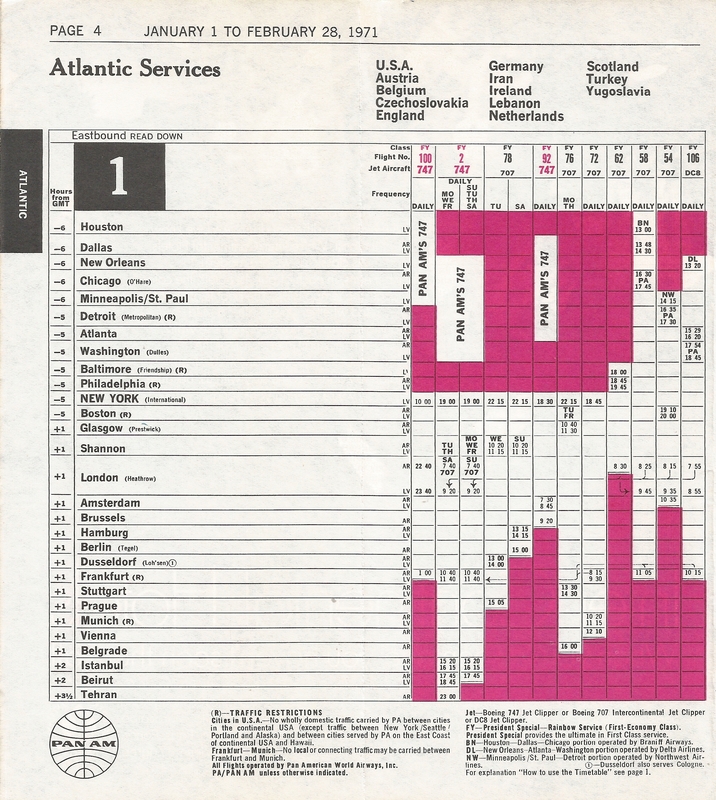 Ironically, the cover of that timetable boasted “More Nonstops Across The Atlantic Than Any Other Airline!”. 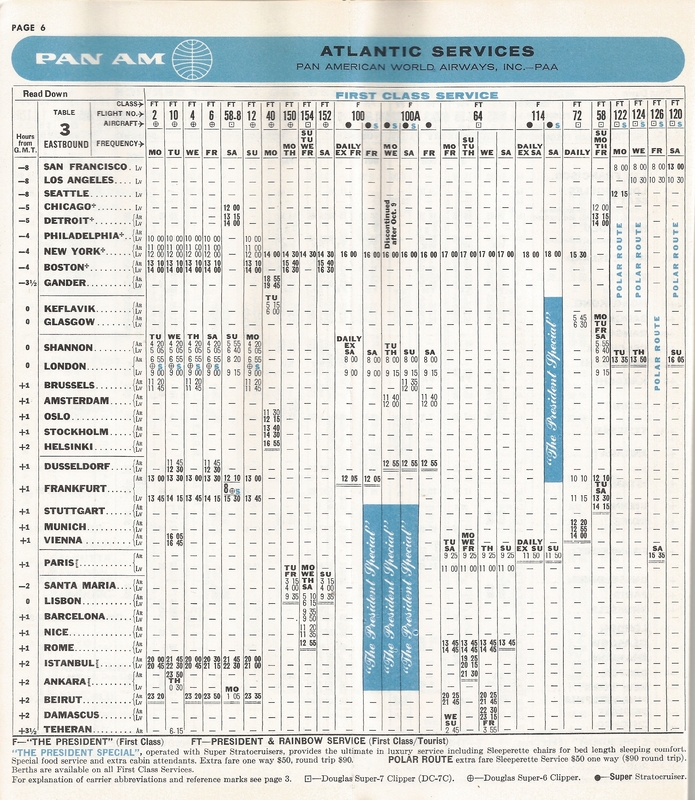 Little did anyone know that six months later, Pan Am would have no transAtlantic routes except for a 3-times weekly Miami-Paris flight. 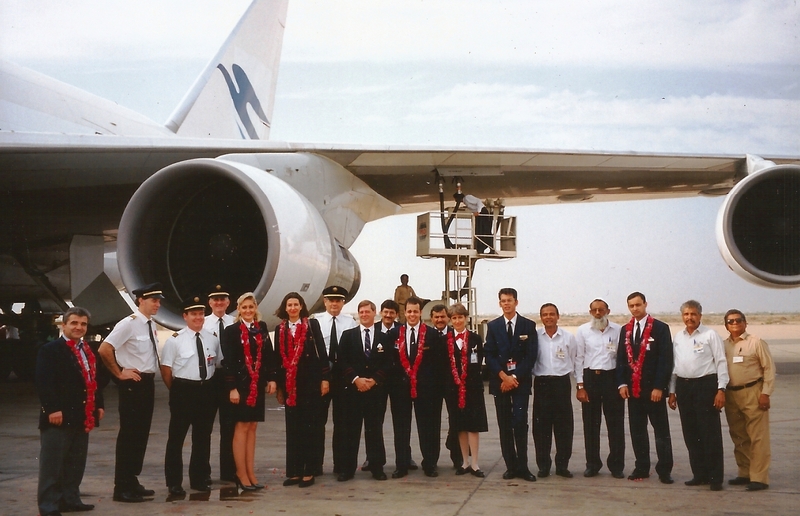 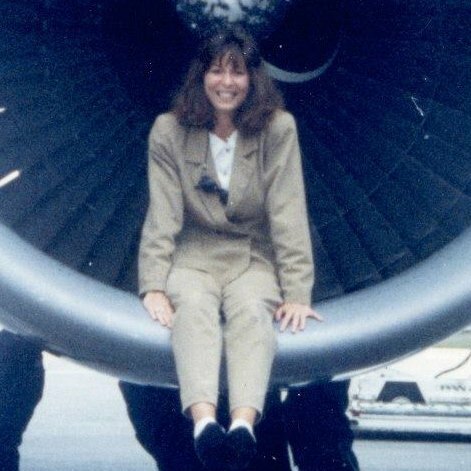 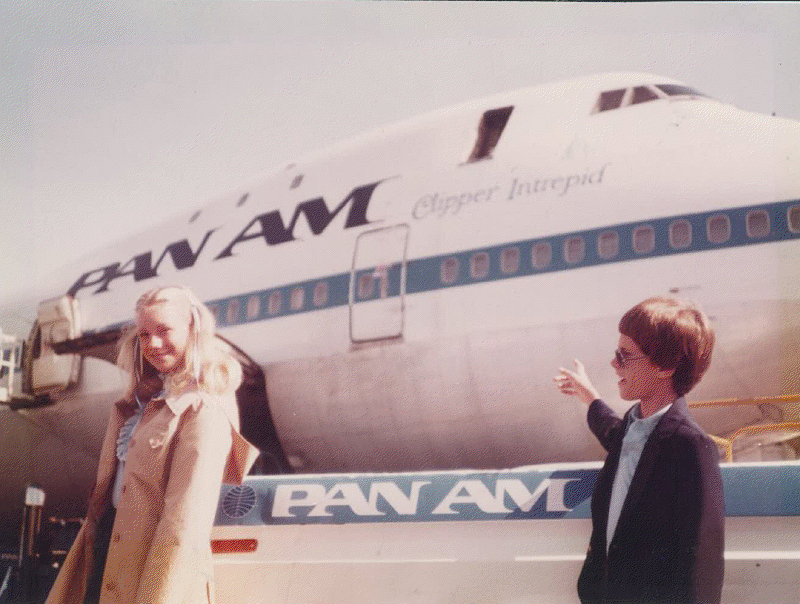 For Bronwen Roberts, a young flight attendant (then Stewardess) for Pan Am, a very special passenger on Flight 100 was one of the highlights of her 31 year career with Pan Am. 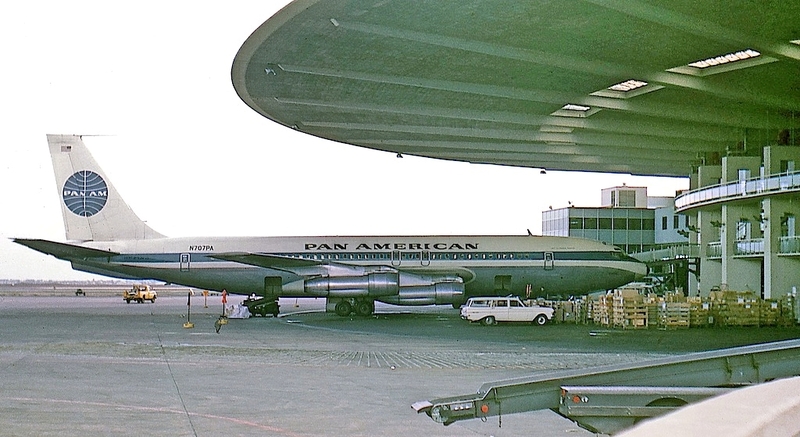 “When I was hired by Pan Am in February 1958, one of 11 from 5,000 applicants, I could not in my wildest dreams have imagined the exciting life I would lead and the fascinating people I would encounter during my 31 year career. 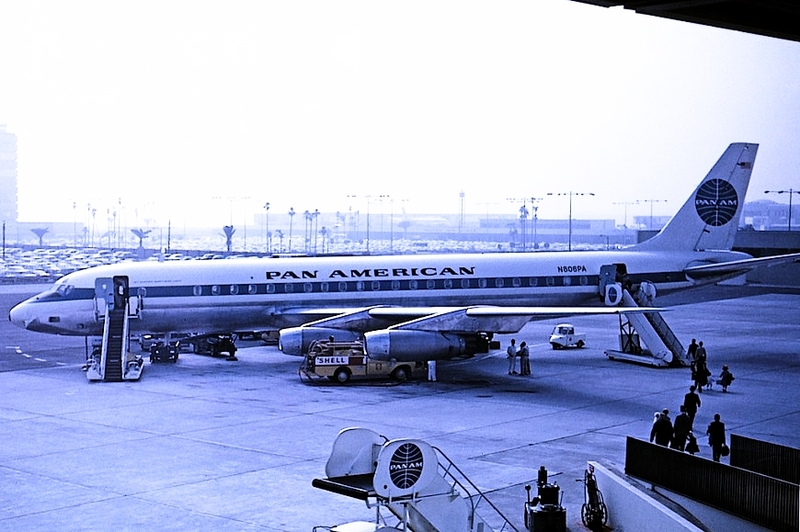 “In the 1960’s Pan Am was the airline of choice for the rich and famous. 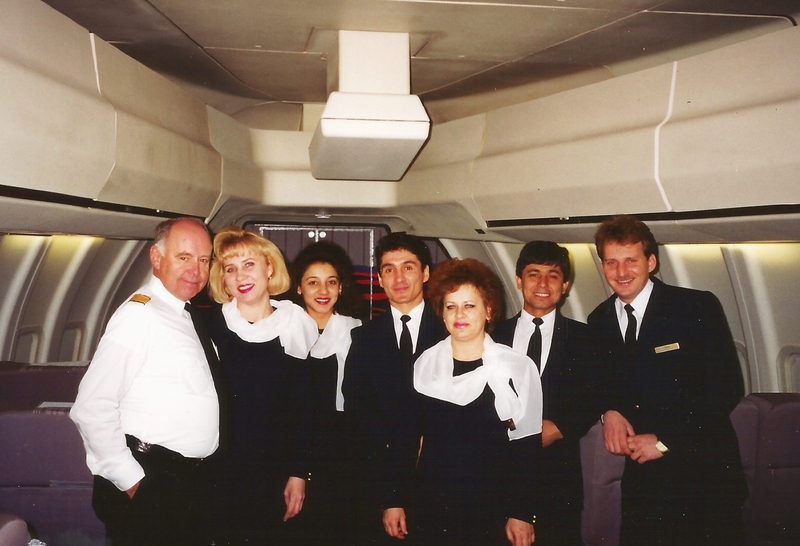 Among the celebrities I had on board were the legendary Charles Lindbergh, films stars Robert Taylor, Warren Beatty, Susan Hayward, Sophia Loren and her husband Carlo Ponti, Audrey Hepburn and her husband Mel Ferrer. 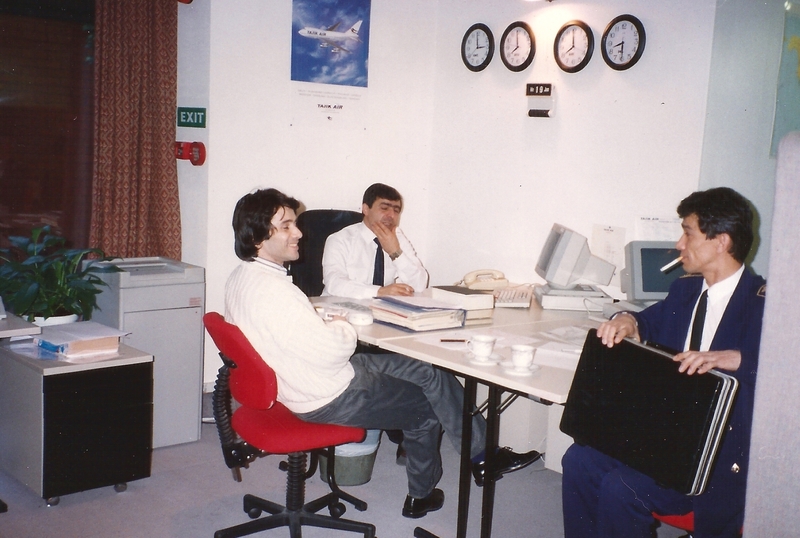 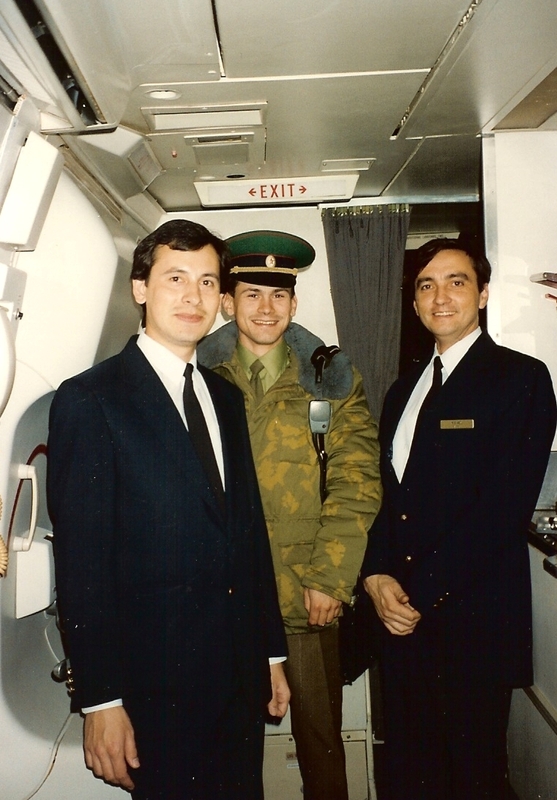 “However my most memorable flight occurred early in my career. 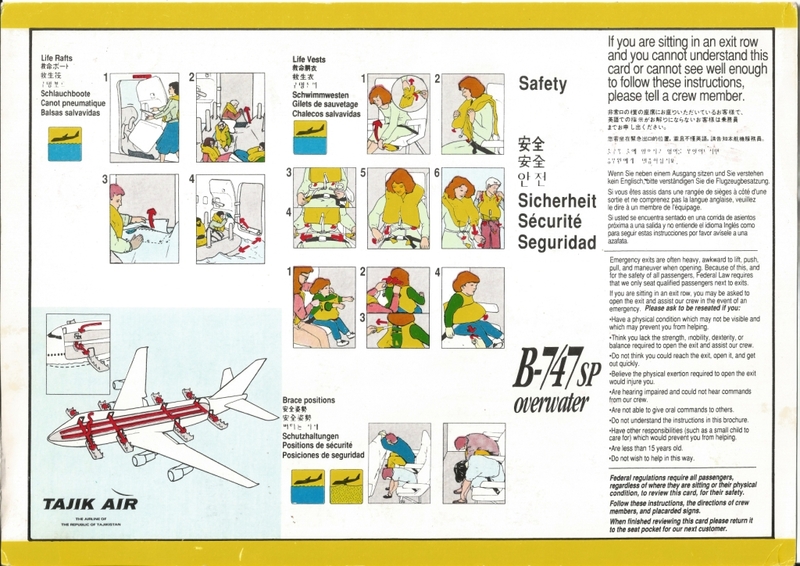 As a child I had been subjected to the terror of air raids over Britain during World War Two and I remember listening to the inspiring speeches given over the radio by our then Prime Minister, Winston Churchill. 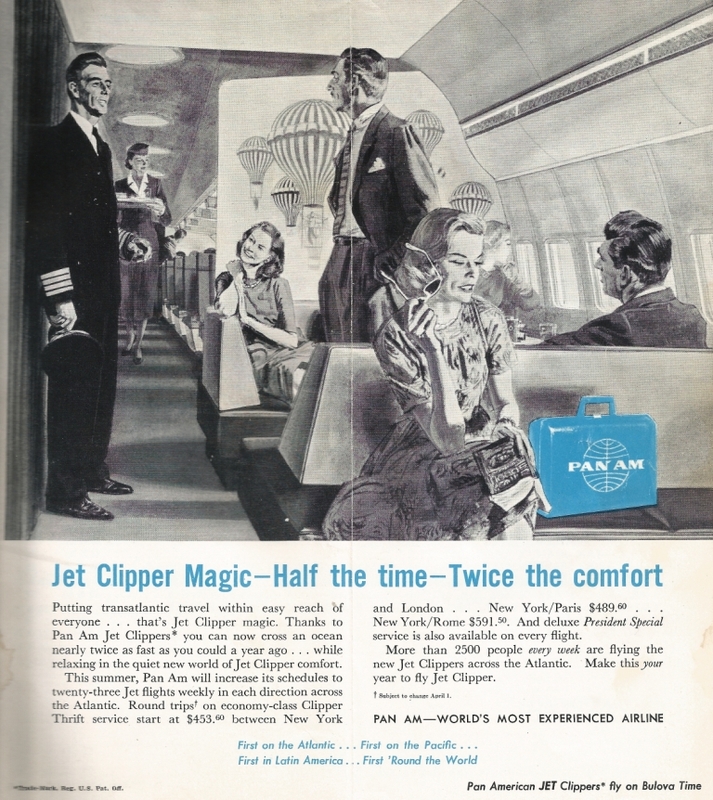 How could I possibly have known then that on April 14th.1961 I would be serving the great man on a Pan Am Clipper flight. 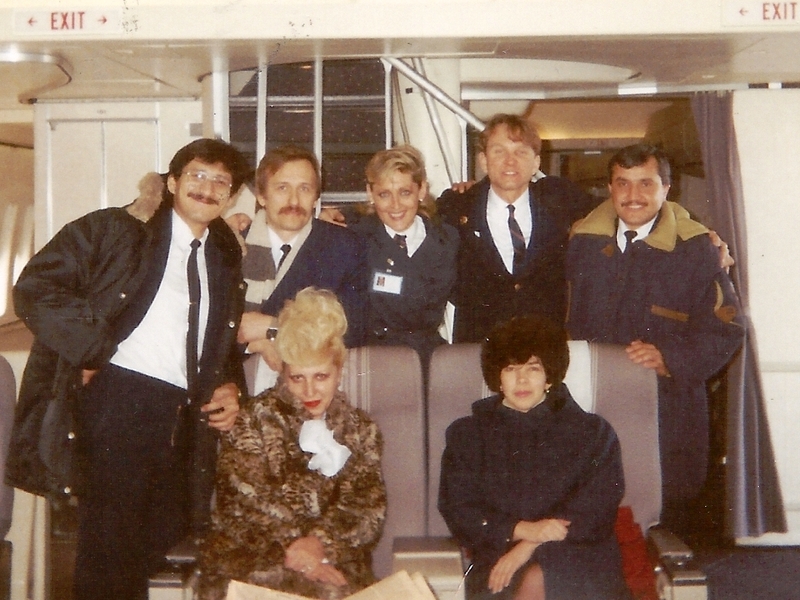 To my everlasting gratitude and indeed to my amazement I was selected to serve Sir Winston on flight 100 from New York along with another British flight attendant, Valerie Wilton, and American purser, Mickey Deangelis. 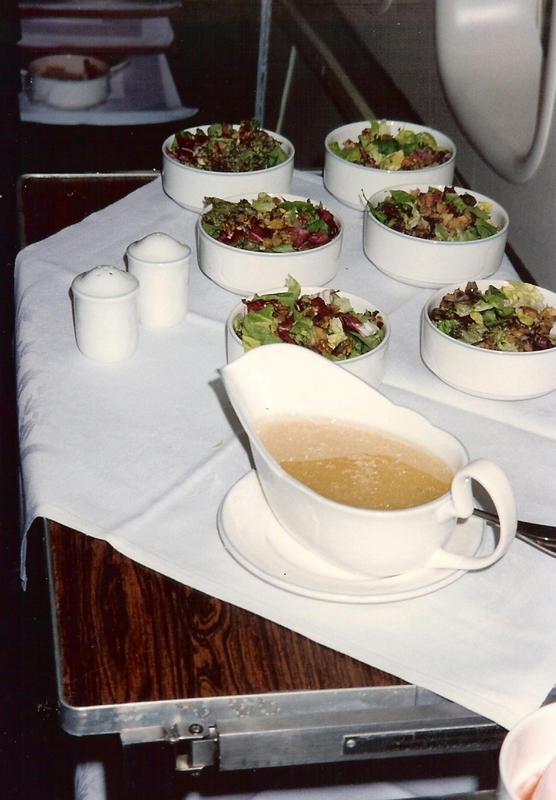 “The flight was uneventful and very pleasant with cocktail service followed by a leisurely lunch, with the regular President Special menu consisting of Hors D’oeuvres, including caviar, Terrapin or cream of mushroom soup; entrees, including Lobster Thermidor, Filet of Sole, Himalayan Partridge Sweetbread Financieres, stuffed Rock Cornish game hen, double lamb chops or Prime Rib of beef, choice of vegetables, salad; and a selection of continental cheeses, desserts and fresh fruit items. 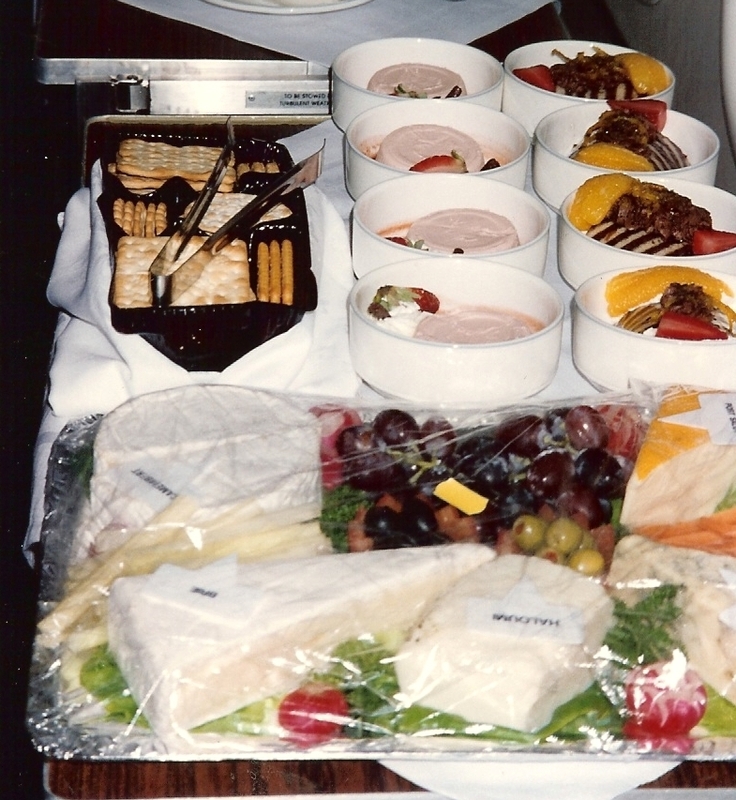 Colmans mustard and horseradish, Stilton cheese, imported teas and crumpets were added. 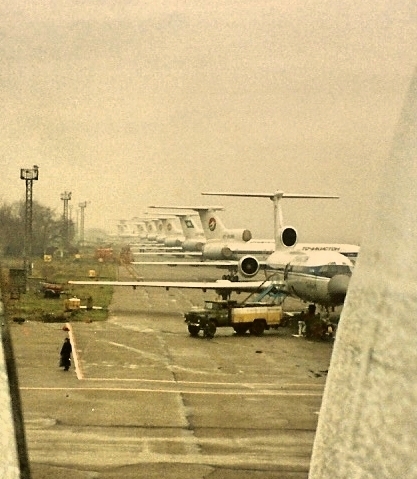 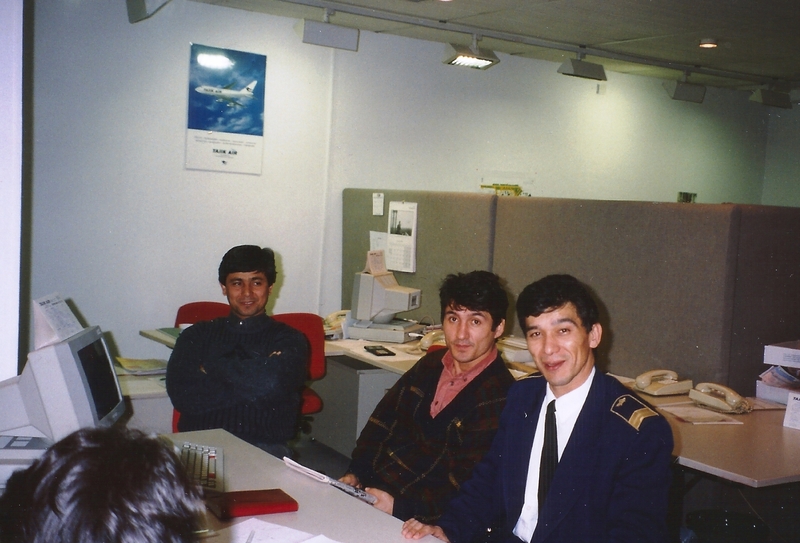 Because of the attractive scheduling, the most senior and experienced pilots were likely in the cockpit. 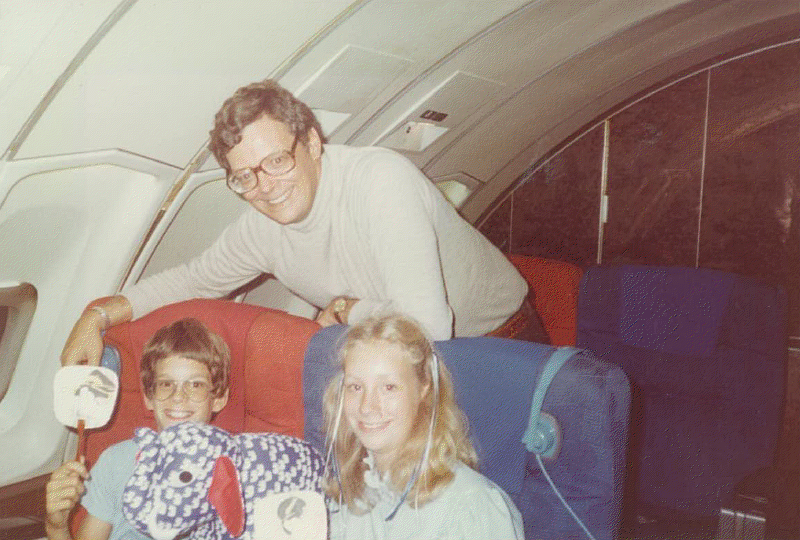 Thus Flight 100 not only provided the best in the cabin, but in the flight deck as well. 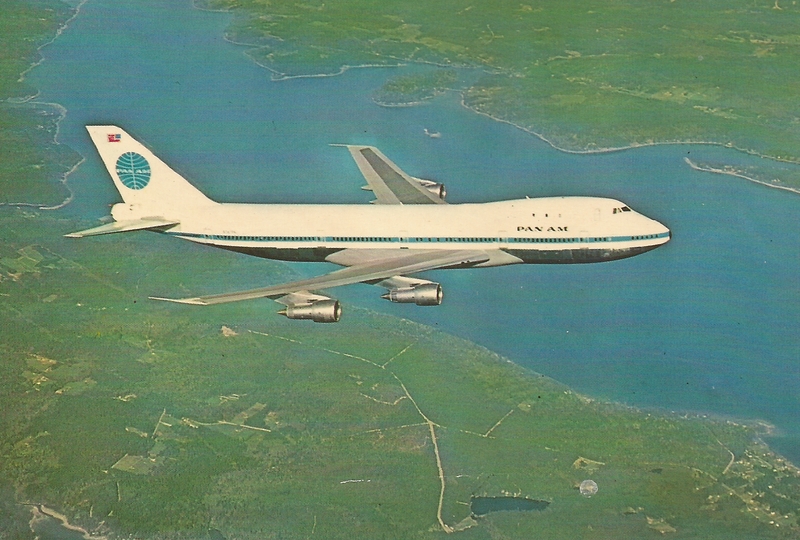 It is fair to say that Pan Am’s Flight 100 set the standard for the ultimate in first class travel. 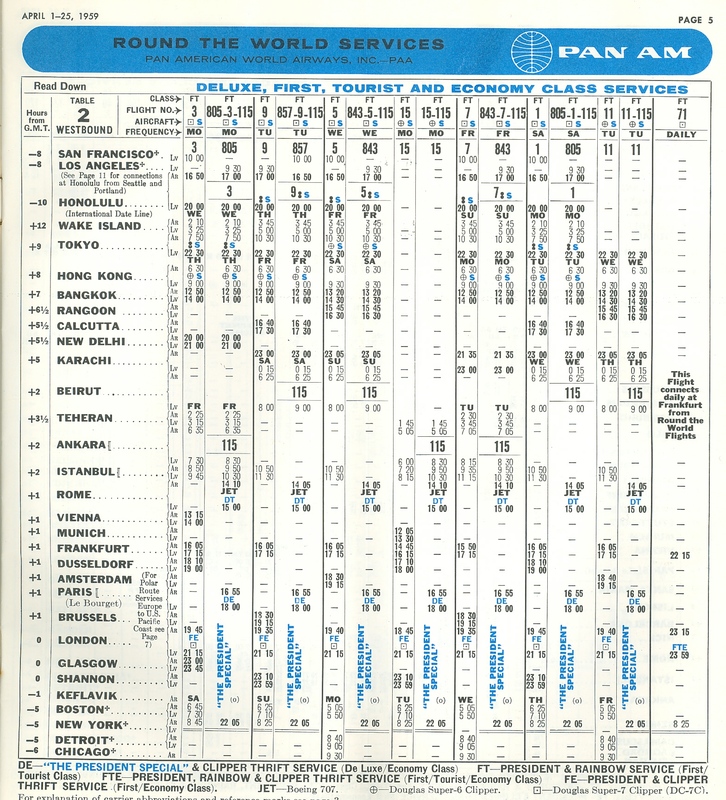 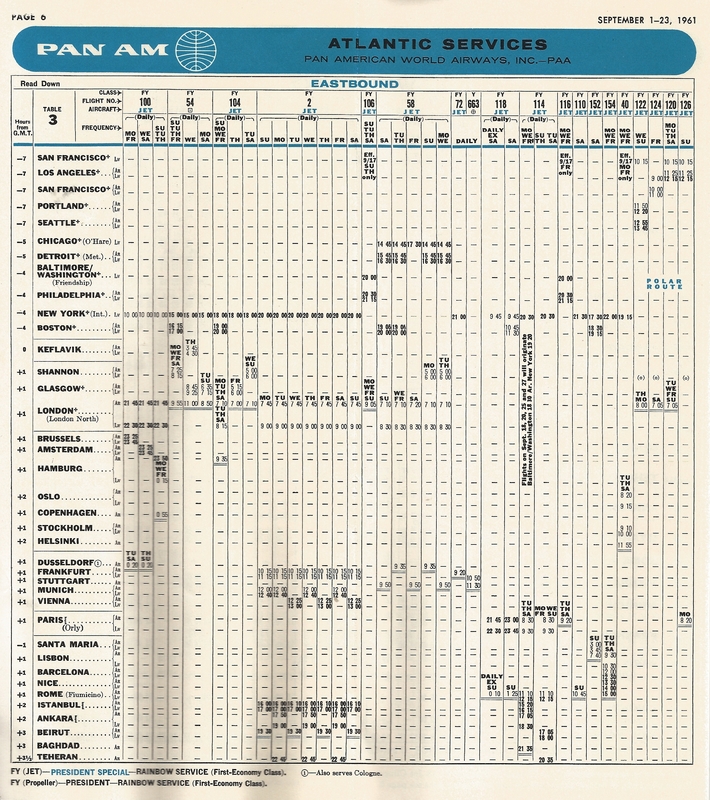 Over the years Pan Am had multiple daily flights between New York and London, but Flight 100 was singled out as the way to travel between the two cities. 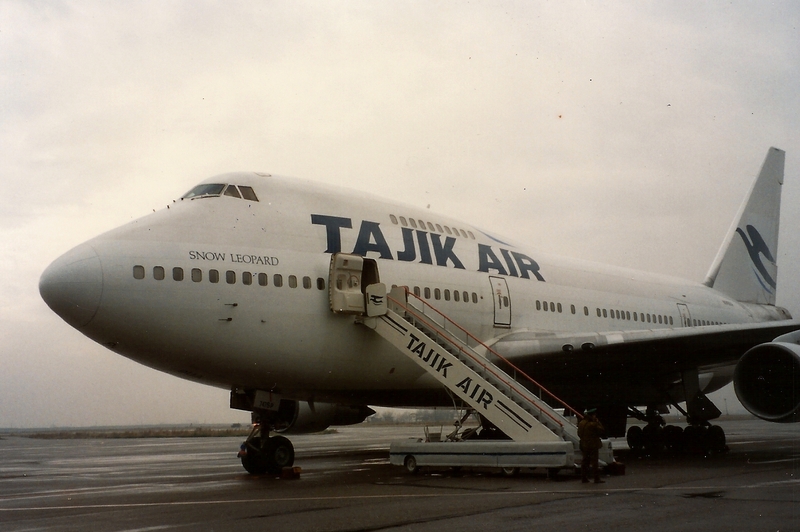 At that level, the only real competition was the Concorde. 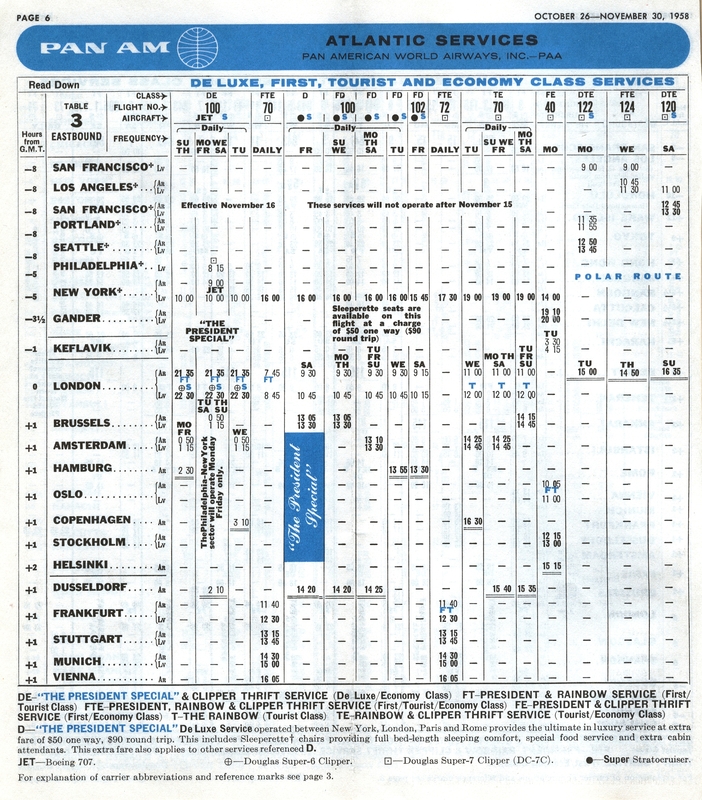 Today, notwithstanding the multiple US cities that have non-stop service to London, New York is still the major departure city from the US to London. 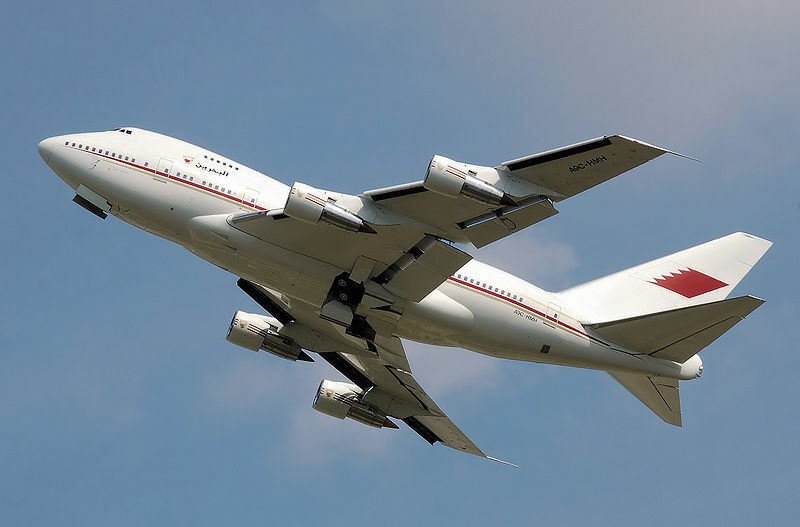 Indeed, between New York Kennedy Airport and Newark Airport, there are upwards of 25 daily flights between the two cities. 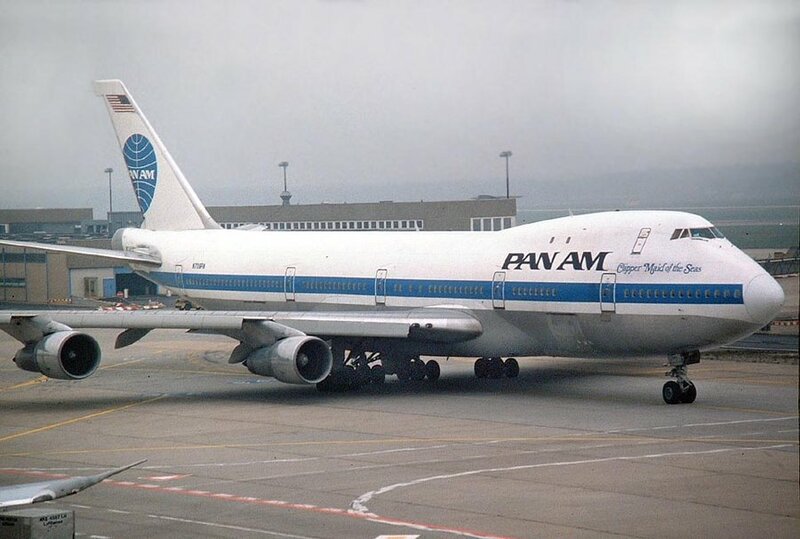 However, credit has to be given to Pan Am for setting the high standards that today’s carriers strive for in that market. 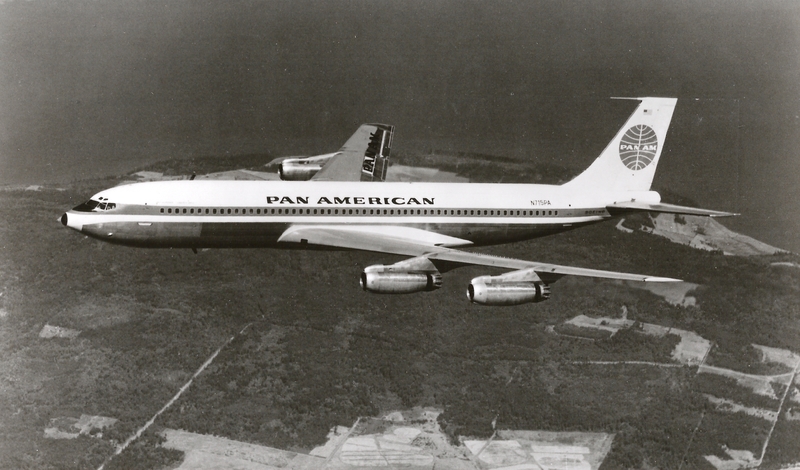 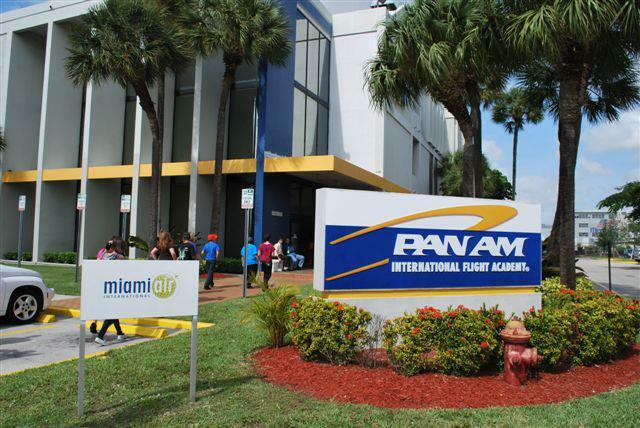 Pan Am may be gone, but its not forgotten. 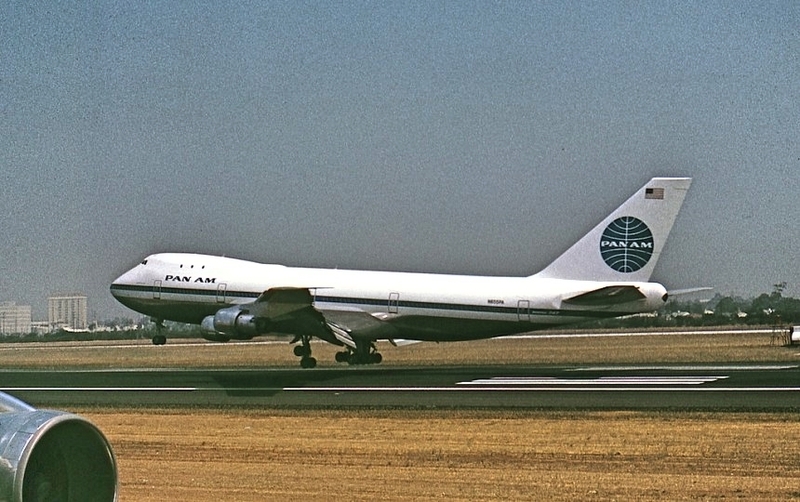 Bronwen Robert’s story about her experiences on Pan Am Flight 100 with Winston Churchill is one of 71 stories in Pan American World Airways – Aviation history Through the Words of its People written by the people of Pan Am who played important roles in many of the important events in Pan Am’s history. 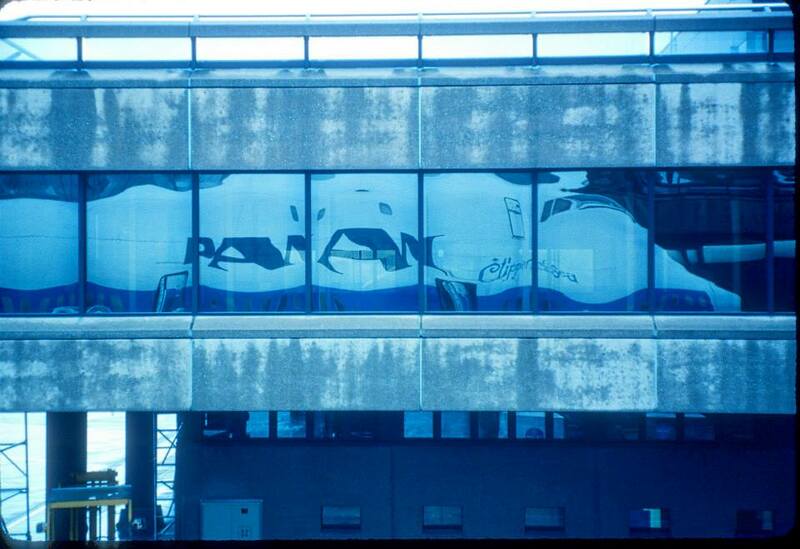 The book is published by BlueWaterPress. 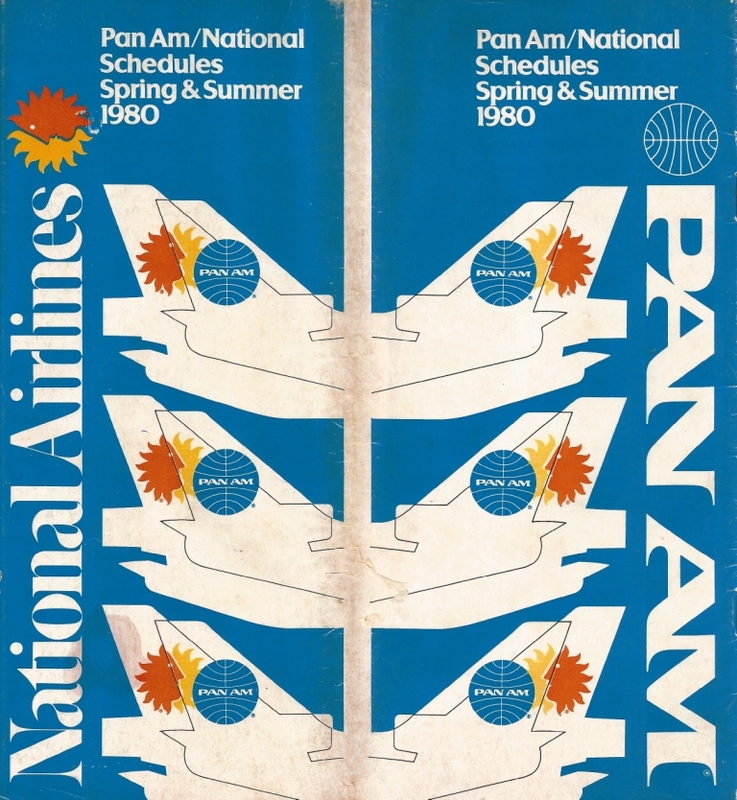 For a companion book with a timeline of Pan Am history and images of aircraft, timetables and other memorabilia, such as illustrated in this article, see a preview of the book Pan American World Airways – Images of a Great Airline. 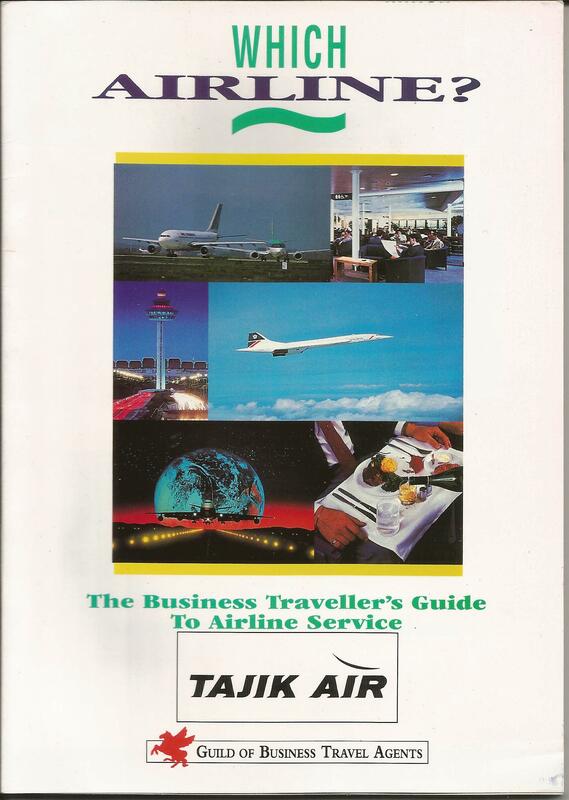 It is also available directly from the publisher, BlueWaterPress or Amazon.